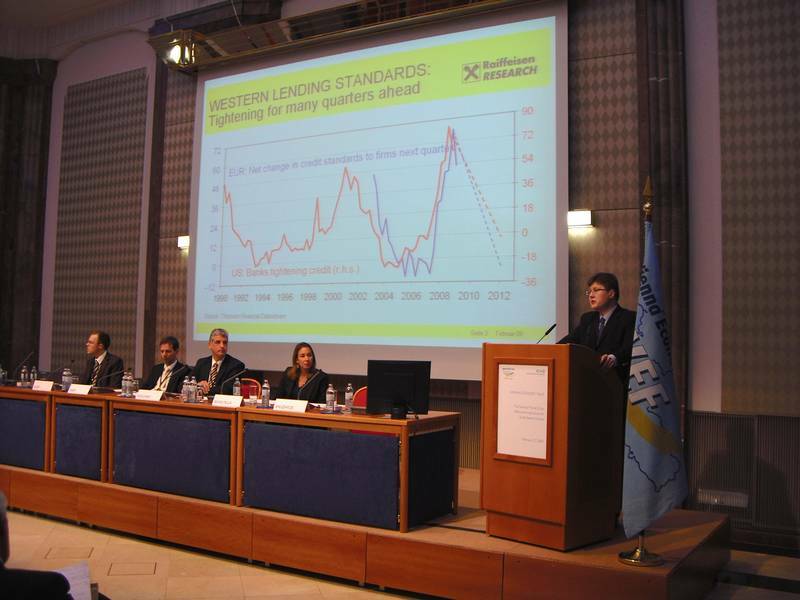 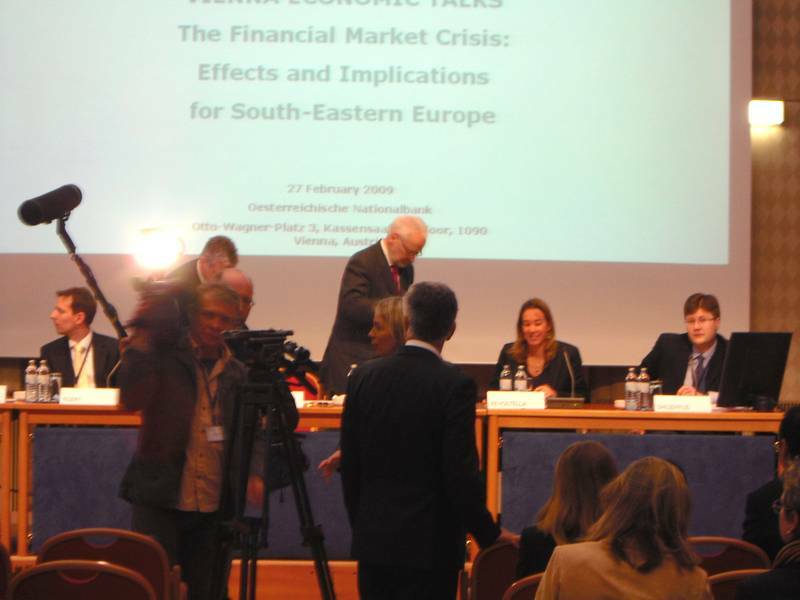 Bank and Insurance Sector: Crisis management: What is the correct policy response and is the IMF providing enough support? 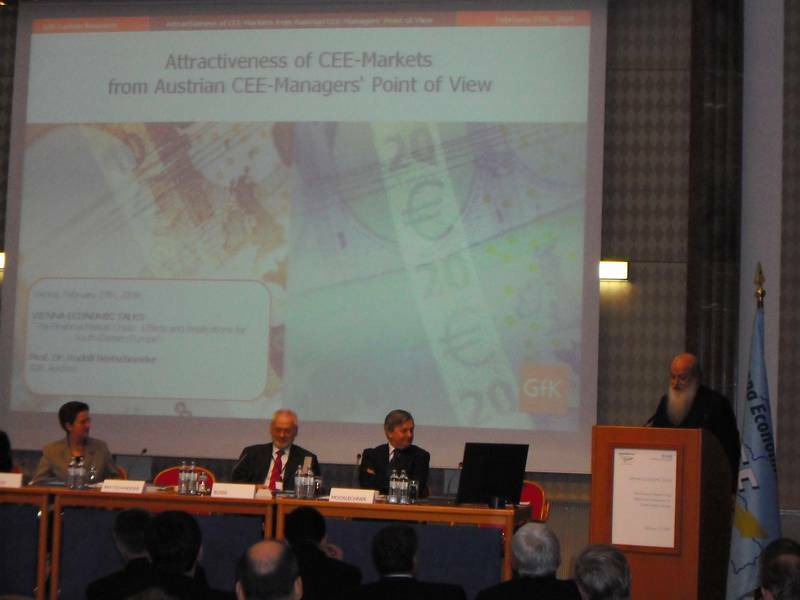 Crisis Time in CEE? 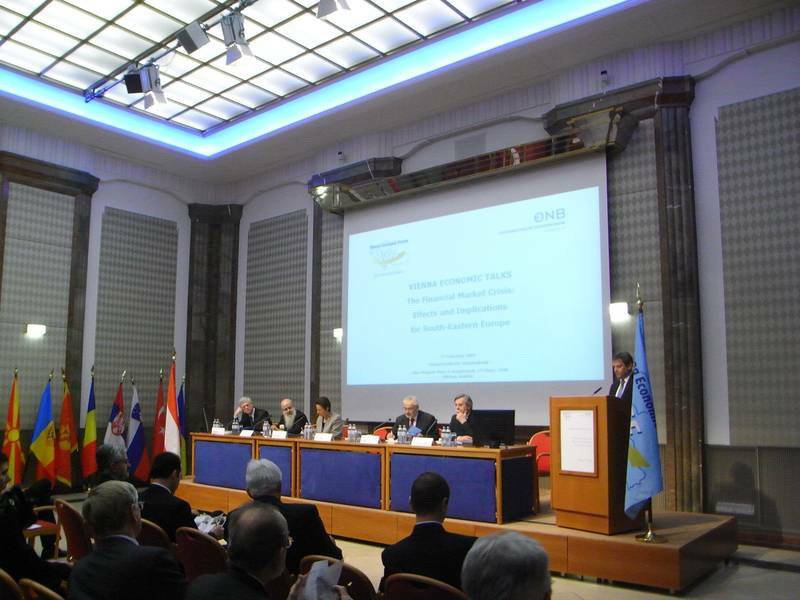 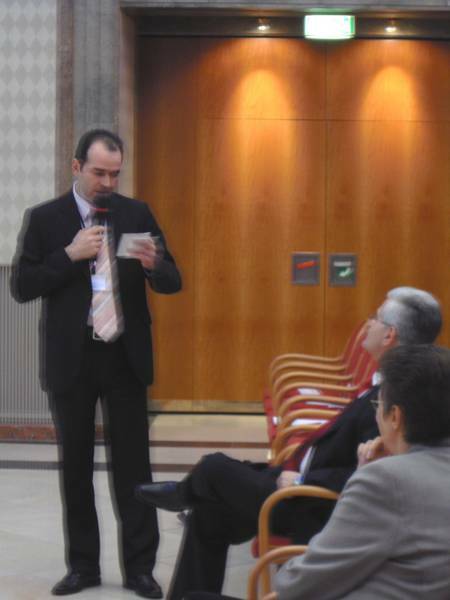 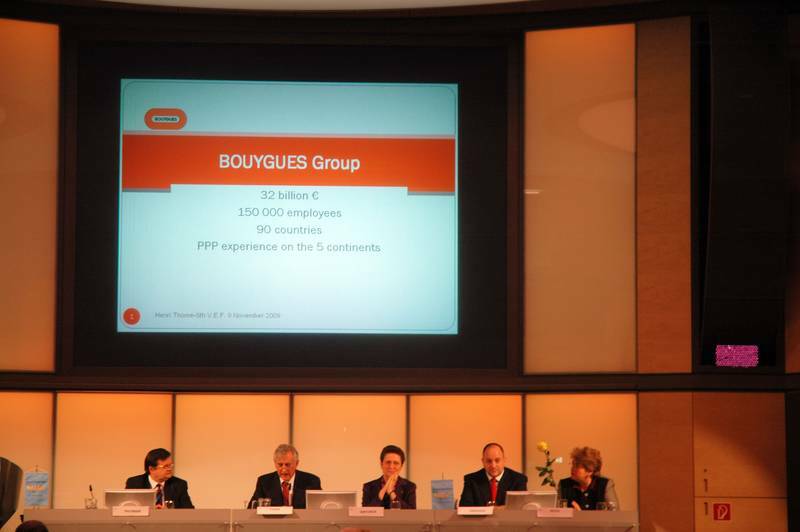 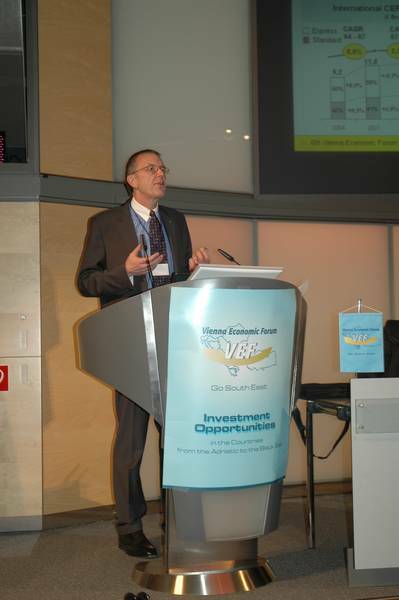 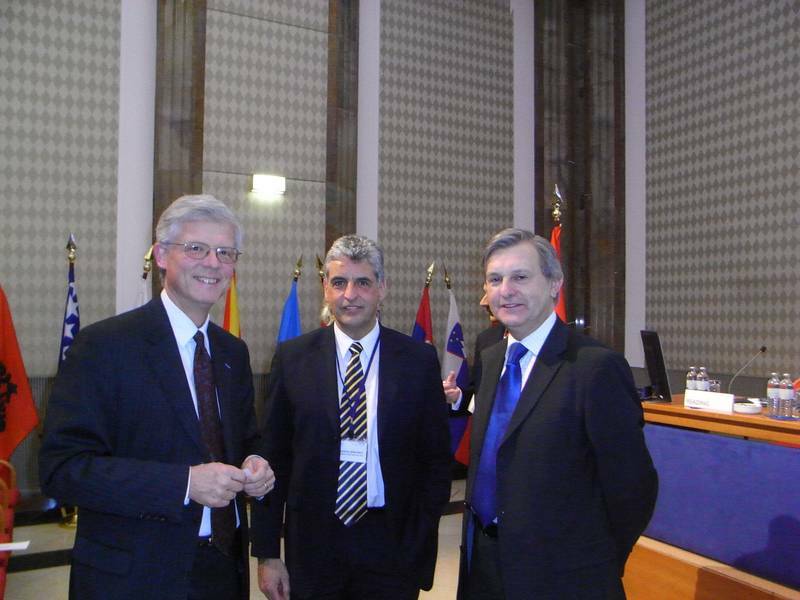 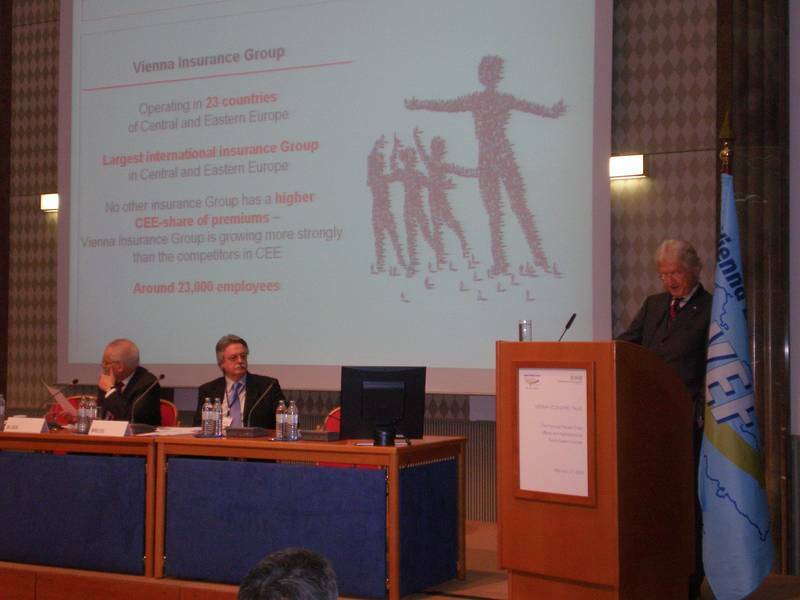 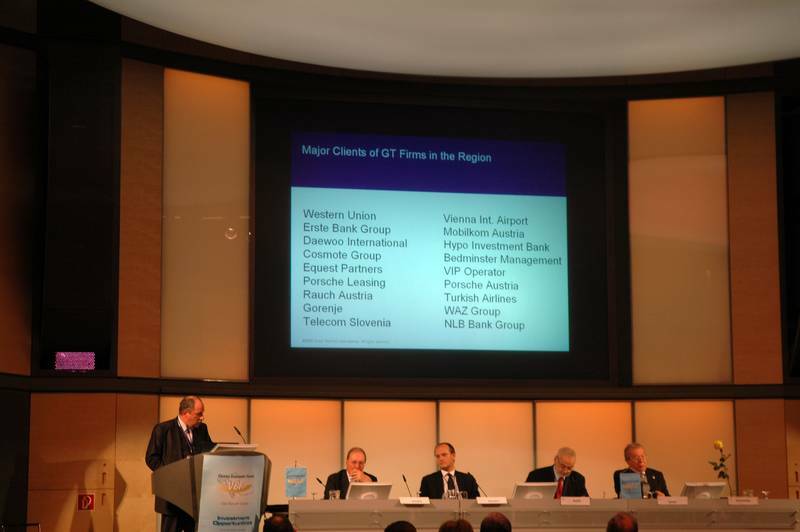 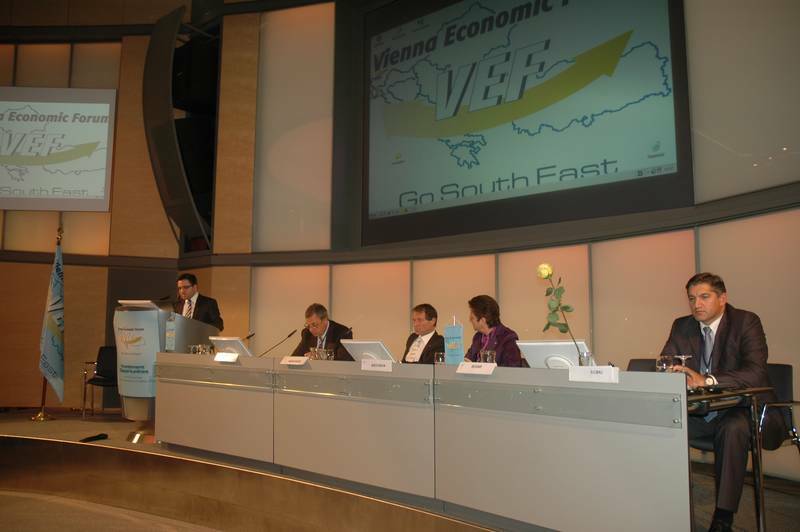 Concrete Projects and Success Stories in the Vienna Economic Forum Member Countries. 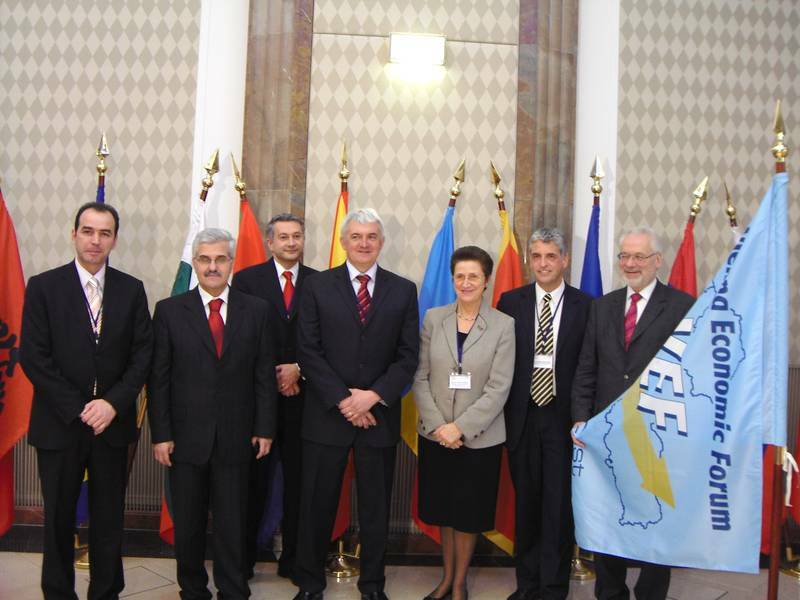 The Danube Cooperation. 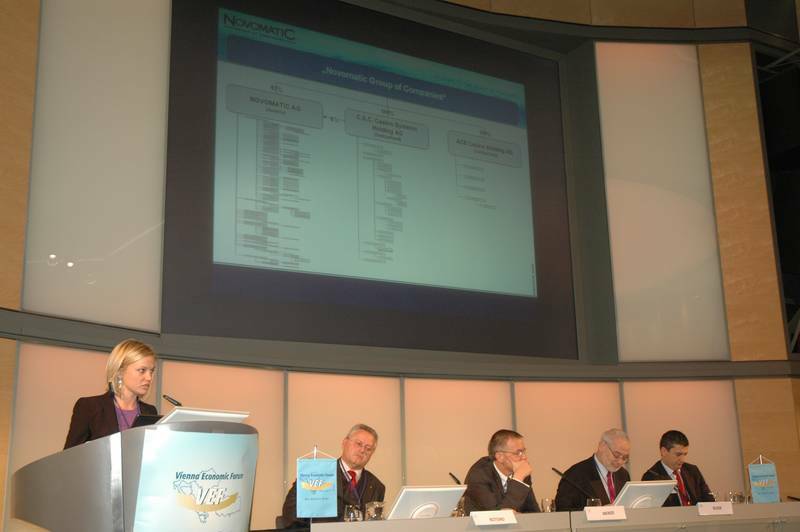 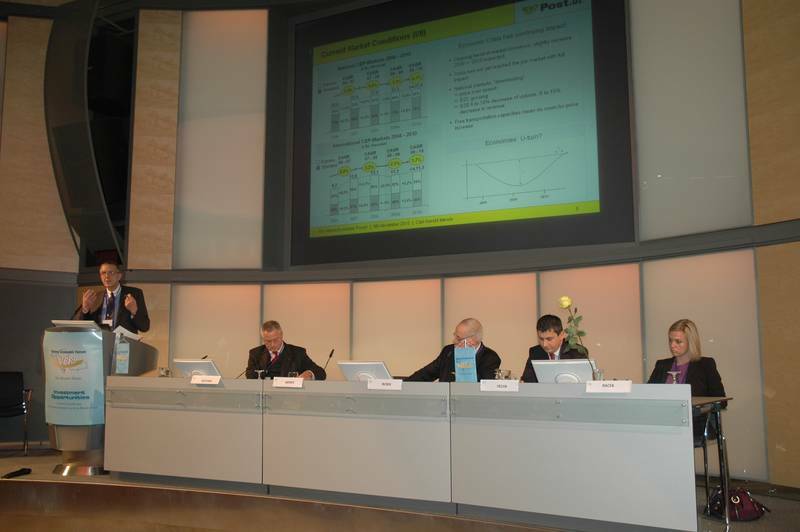 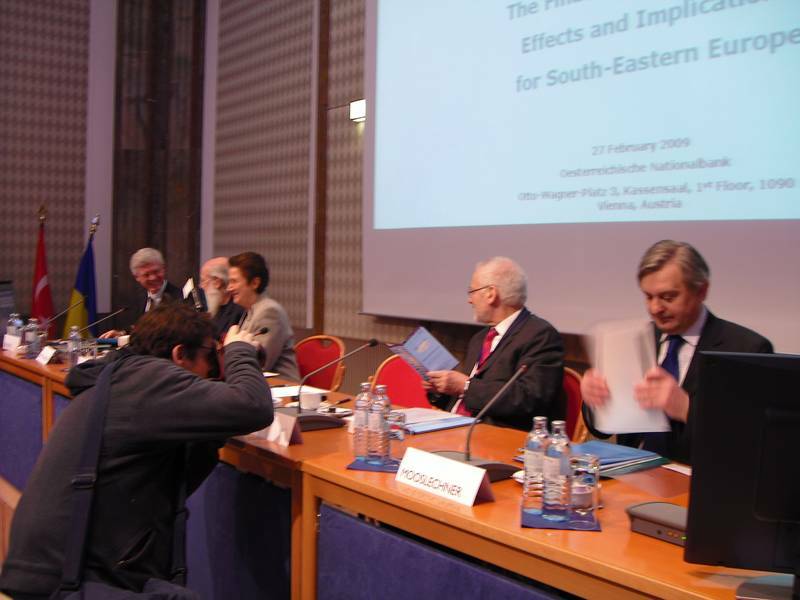 Regional Energy Prospects in 2010 and beyond. 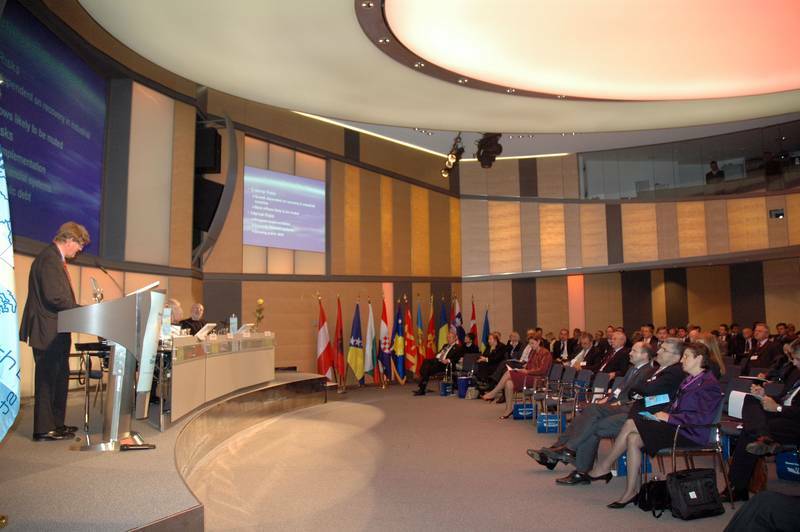 Concrete Projects. 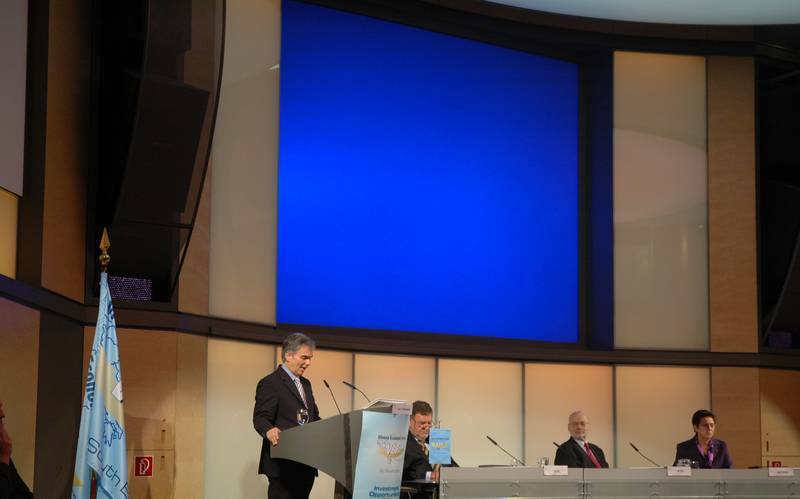 Energy Saving. 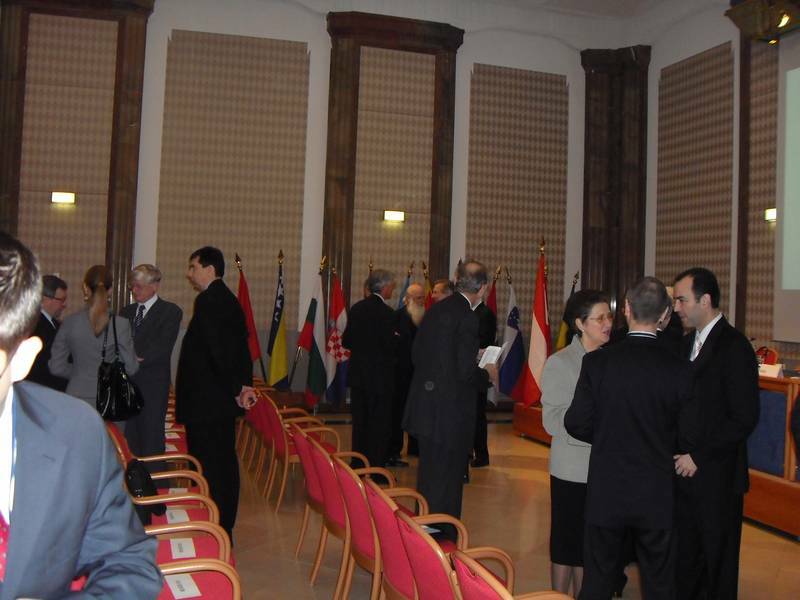 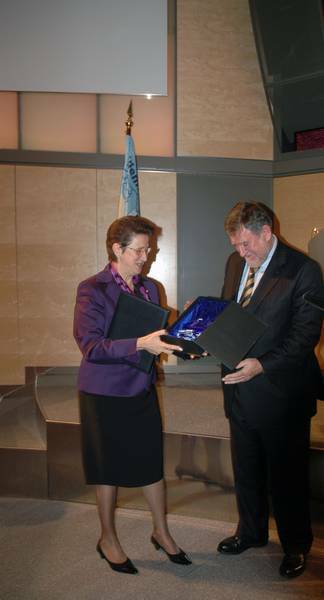 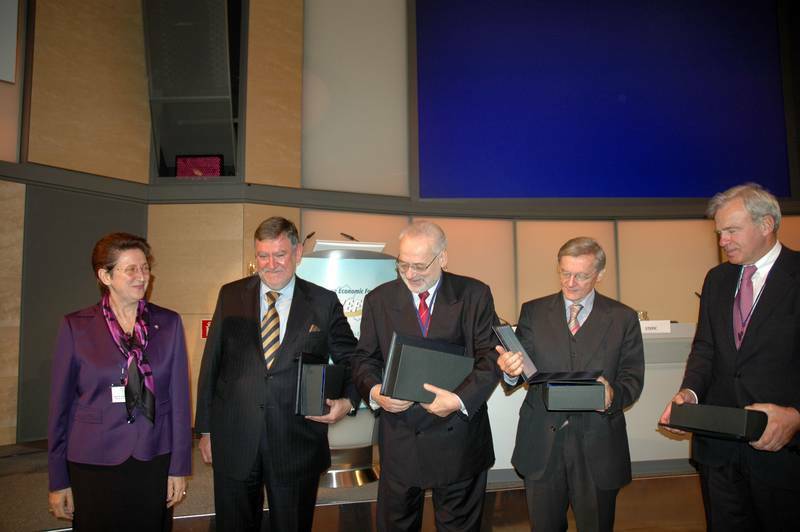 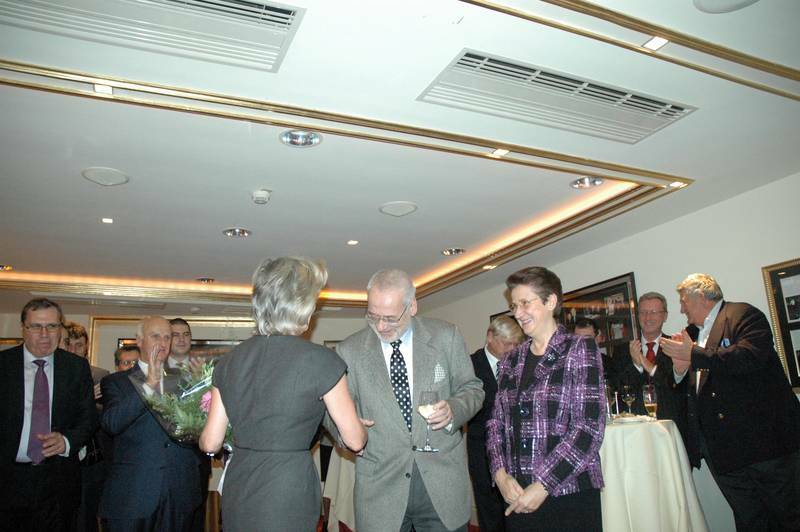 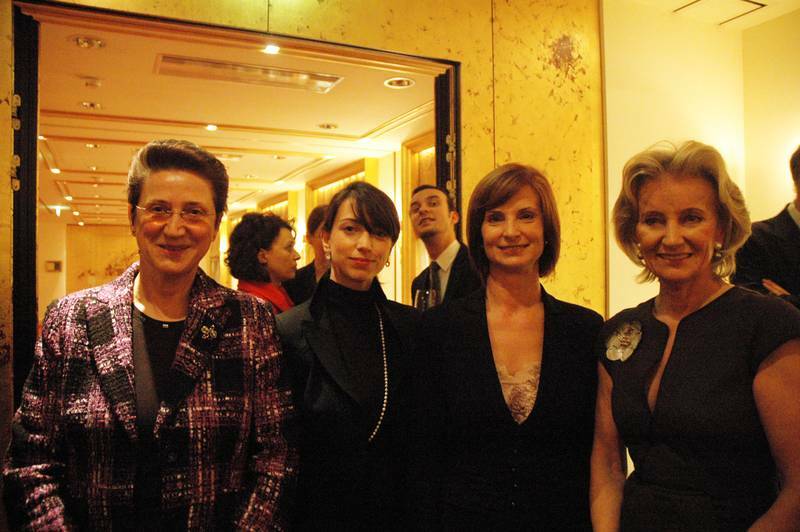 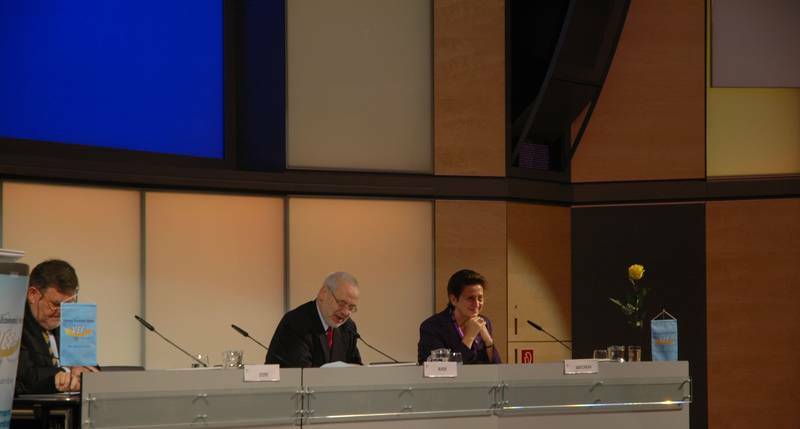 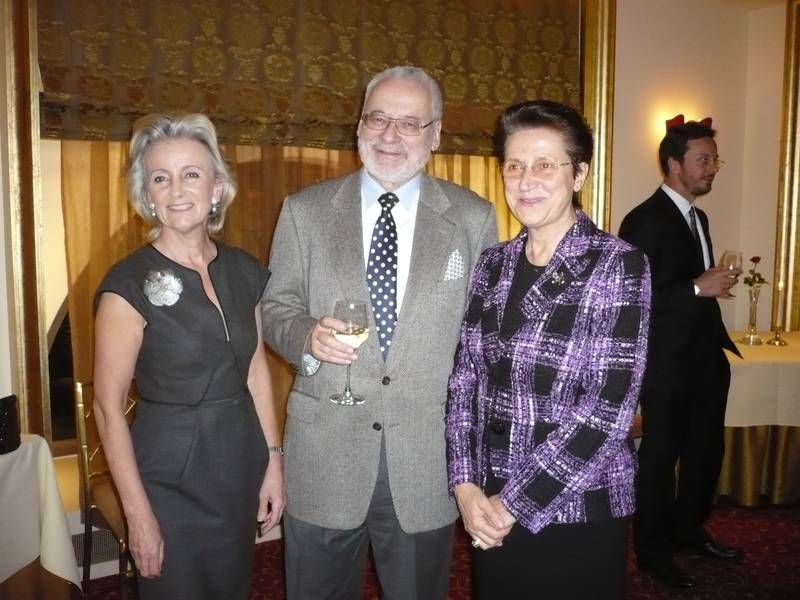 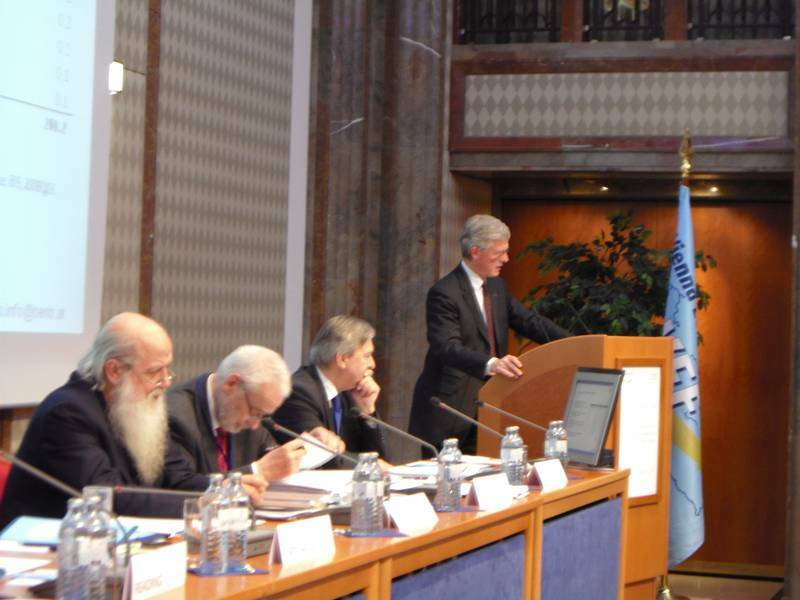 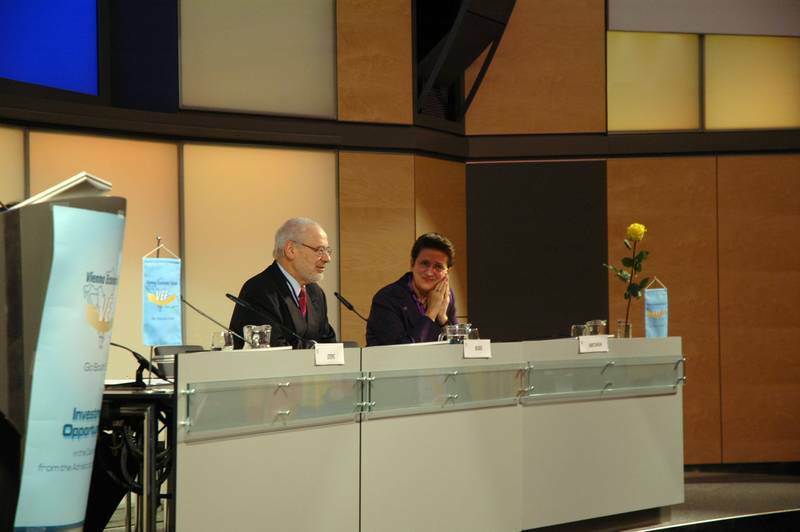 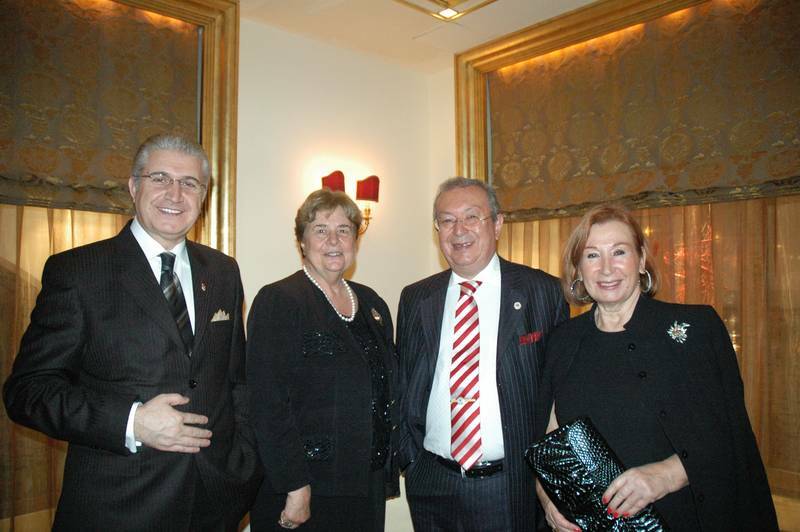 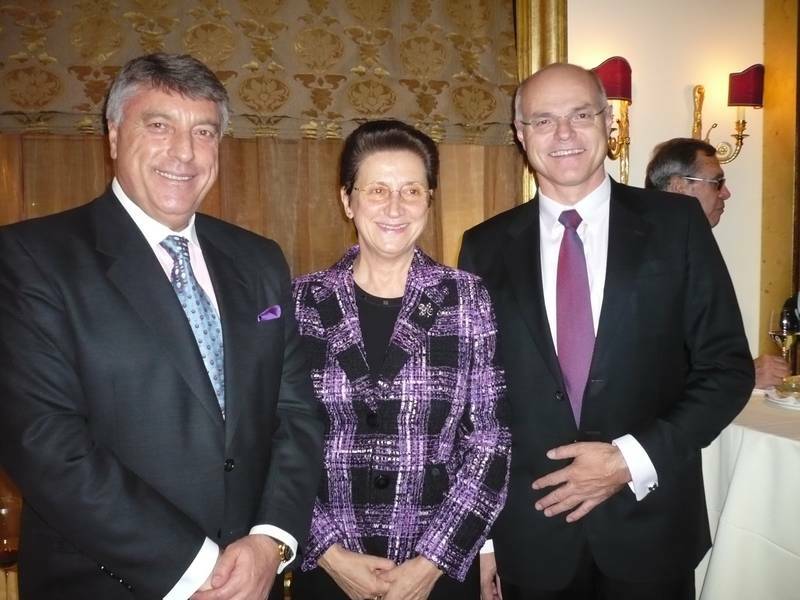 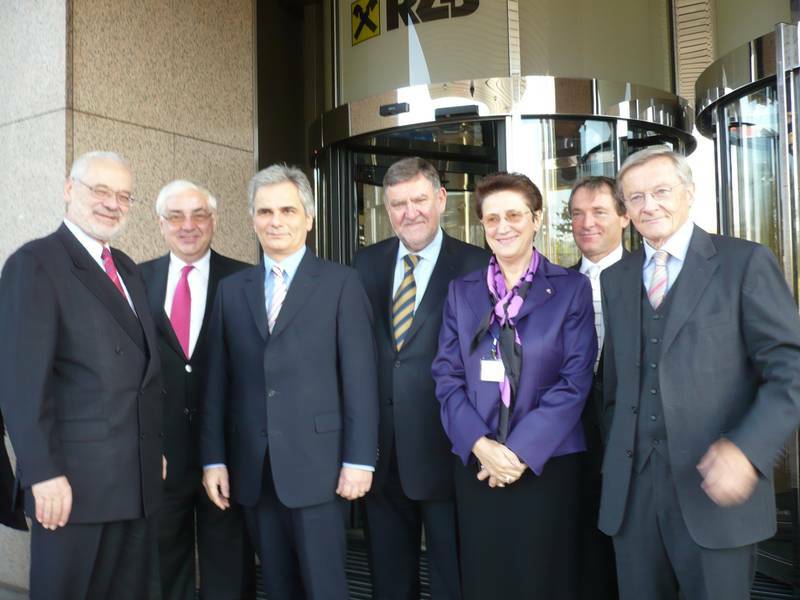 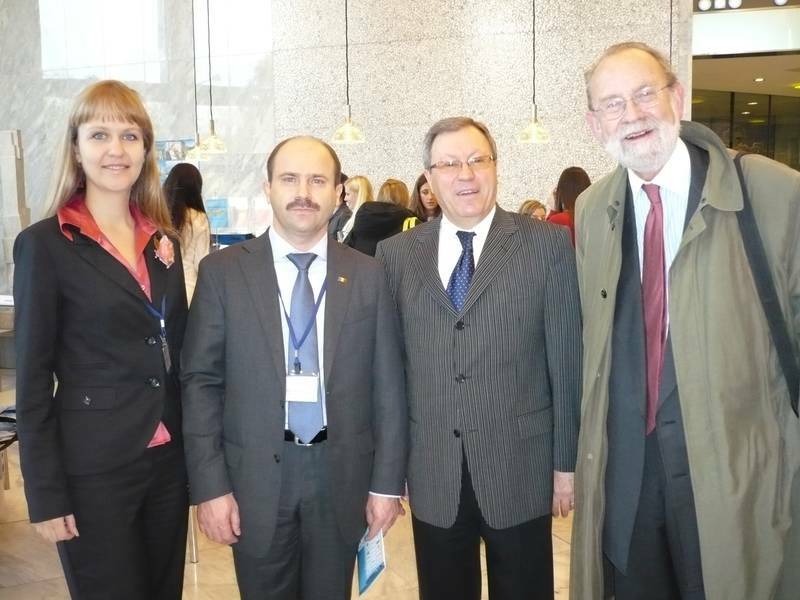 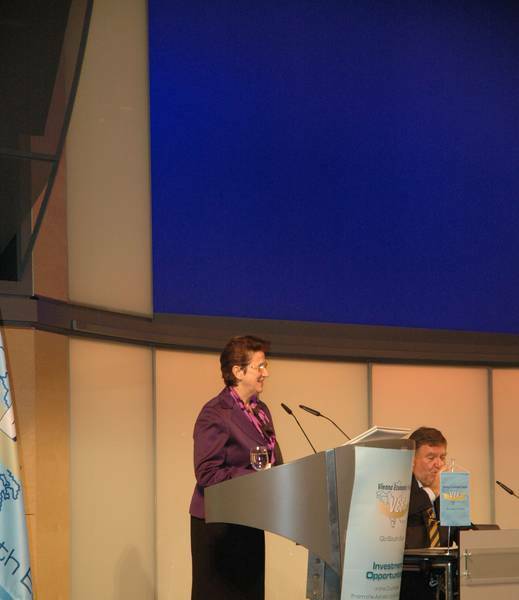 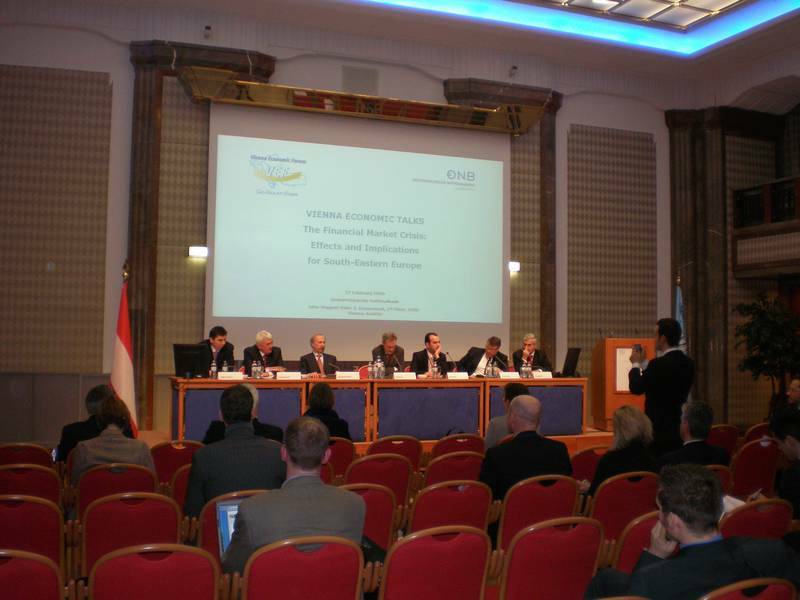 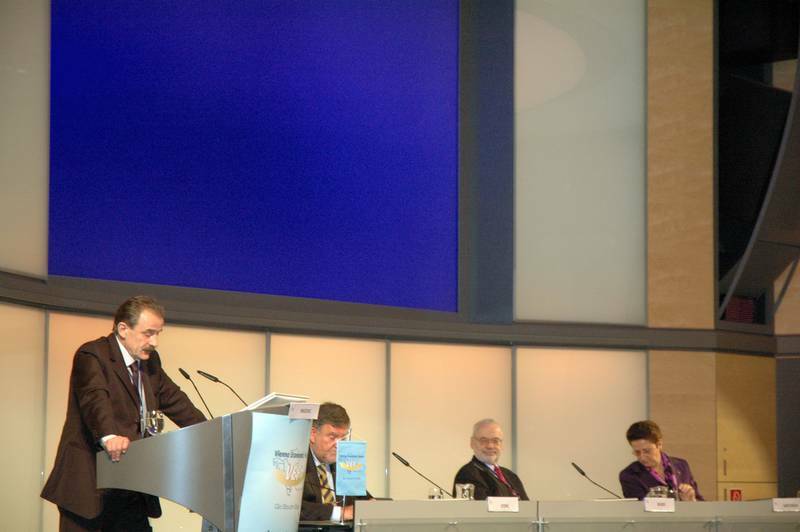 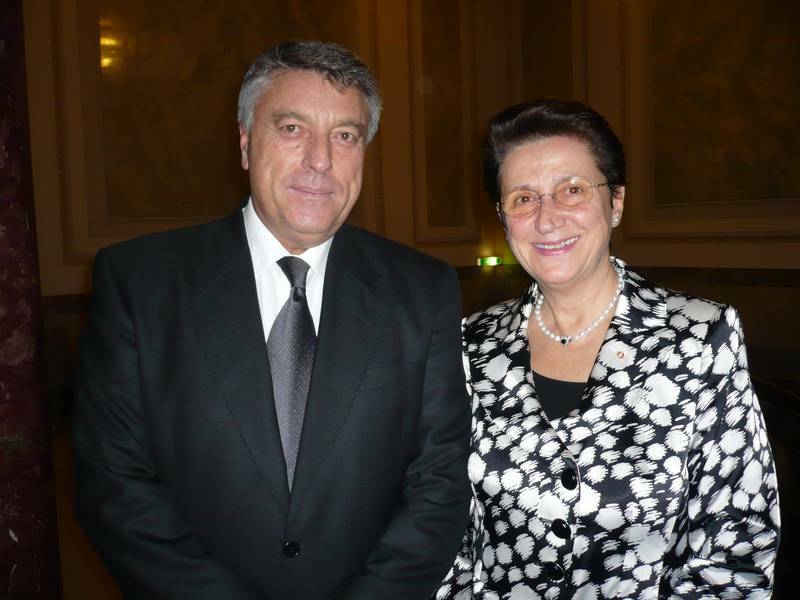 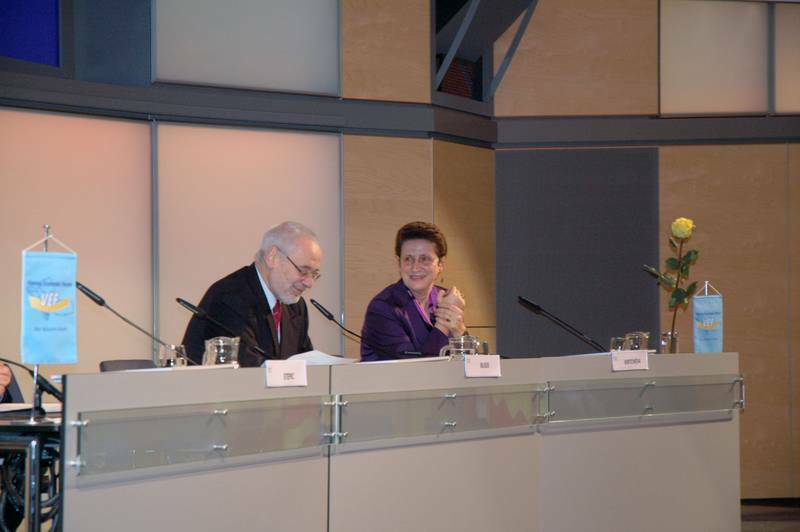 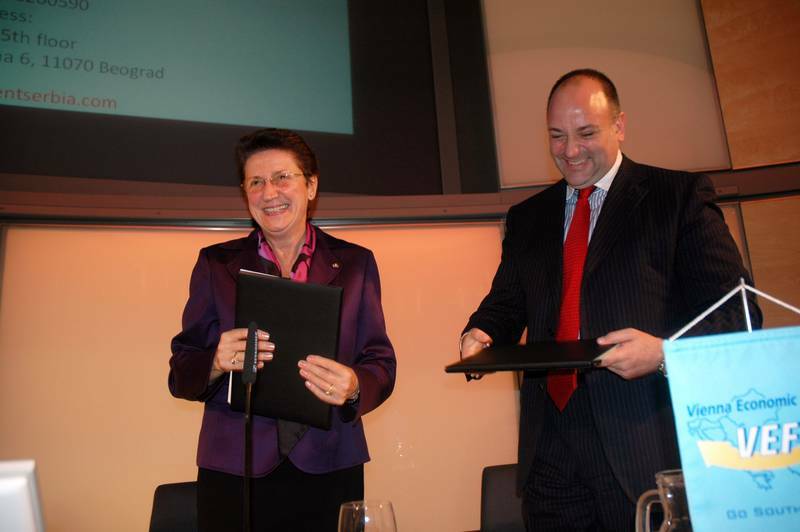 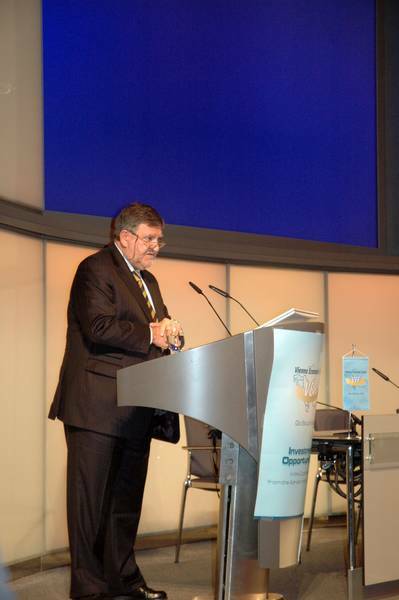 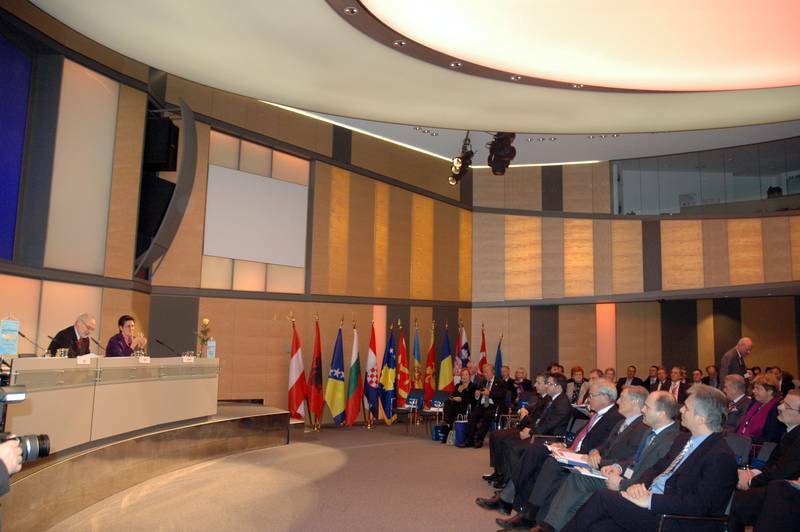 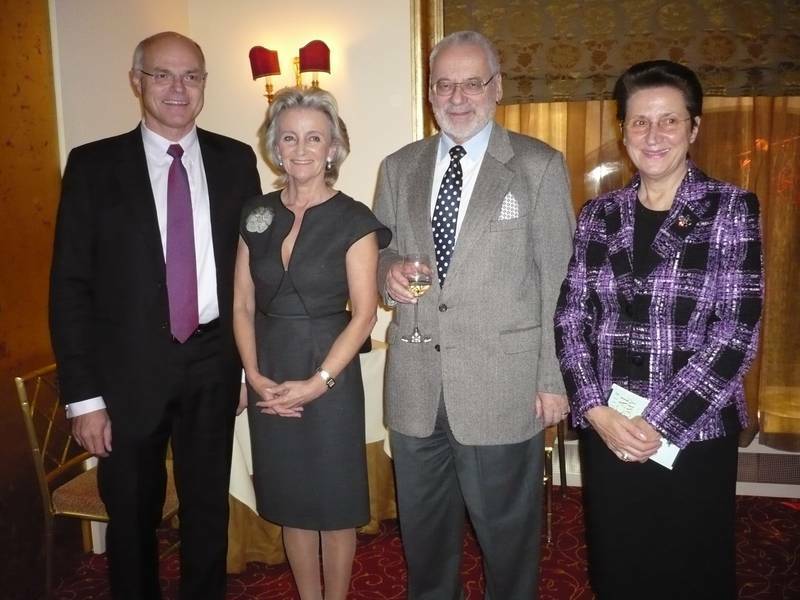 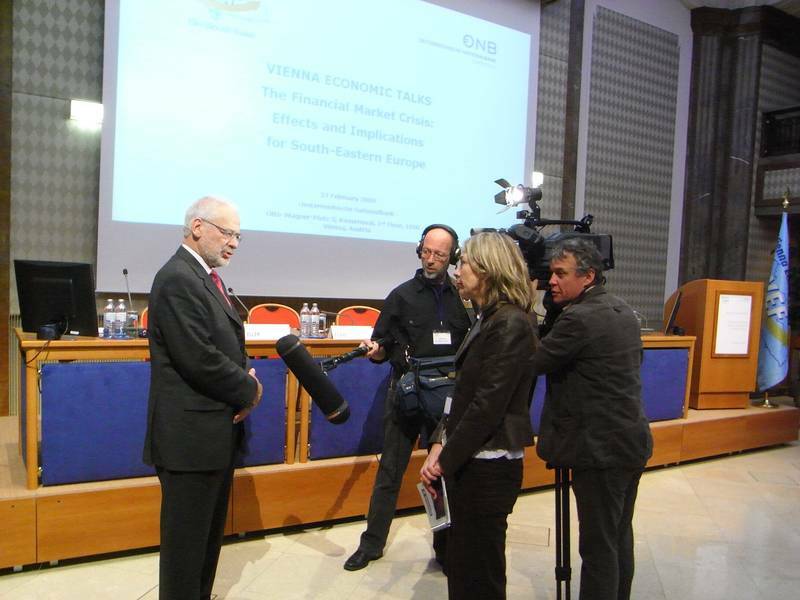 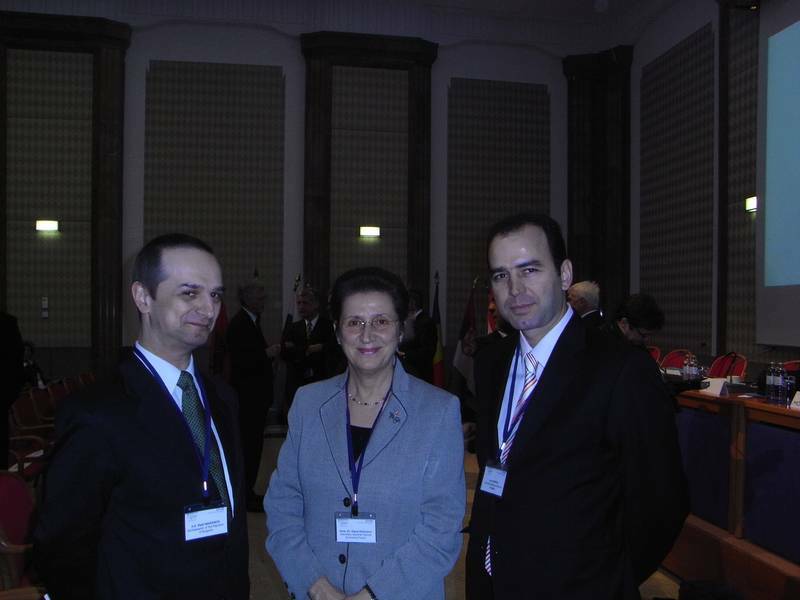 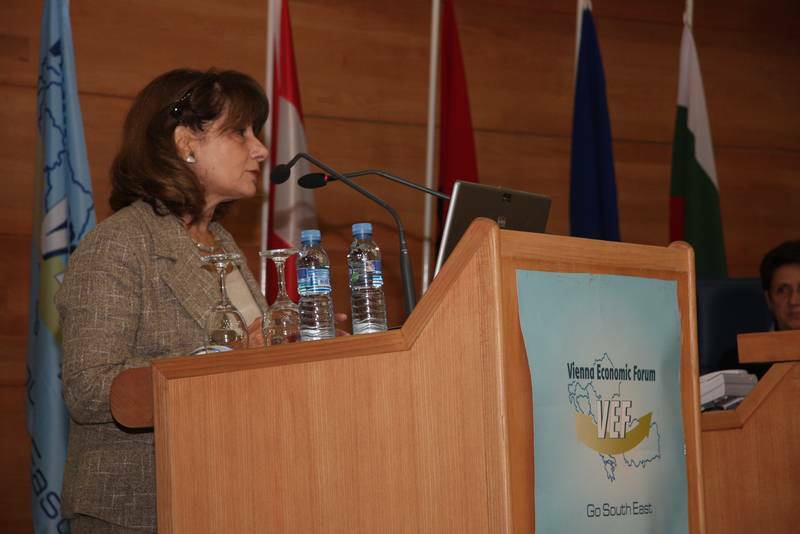 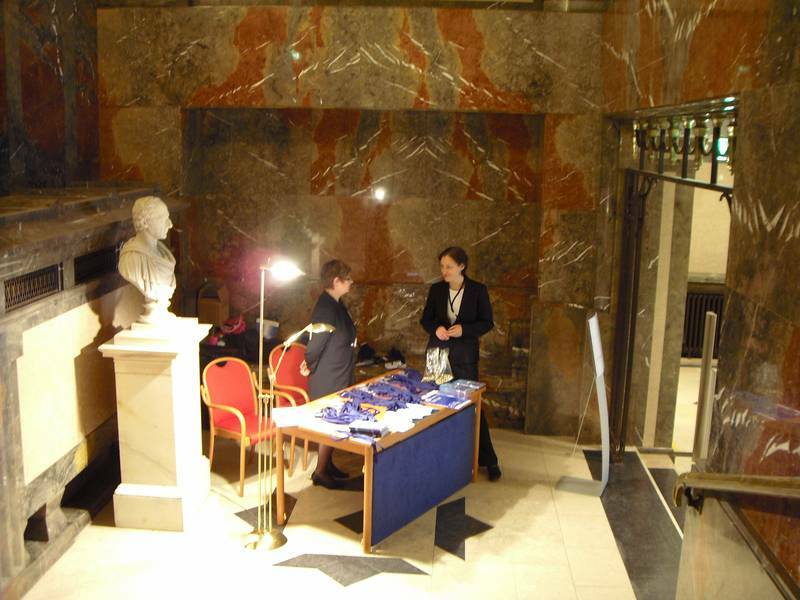 At this year’s 6th Vienna Economic Forum on November 9 and 10, 2009 President Dr. Erhard Busek and Secretary General Ambassador Dr. Elena Kirtcheva had the great pleasure to welcome around 400 participants from 30 countries throughout the world. 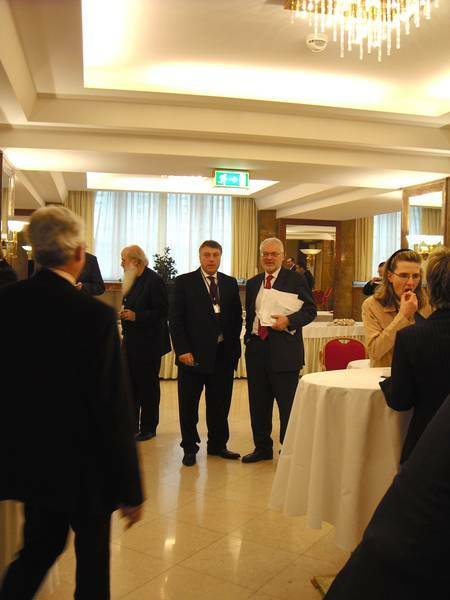 Beside our honourable VIP-Guests, Deputy Prime Ministers, Ministers from our Member countries, high ranking representatives from Energy Community Secretariat, International Monetary Fund (IMF), Regional Cooperation Council located in Sarajevo, Southeast European Cooperative Initiative (SECI), South-East European Cooperation Process (SEECP), United Nations Industrial Development Organization (UNIDO) and United Nations Industrial Development Organization) took part in the meeting. 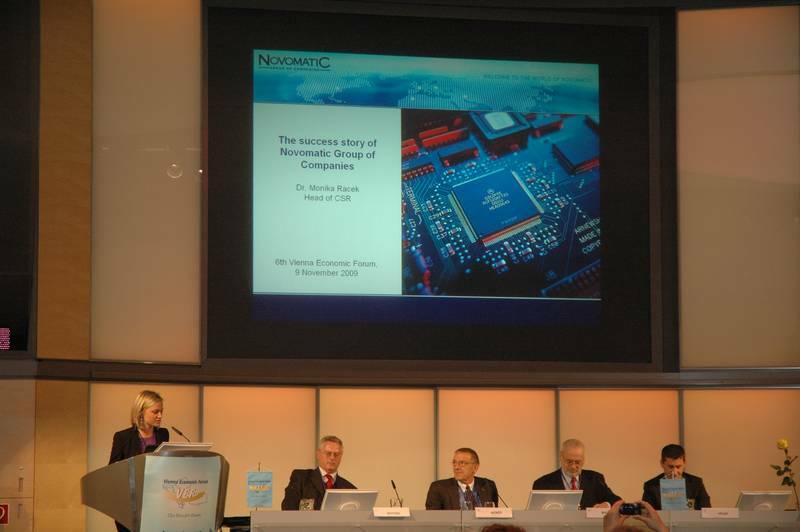 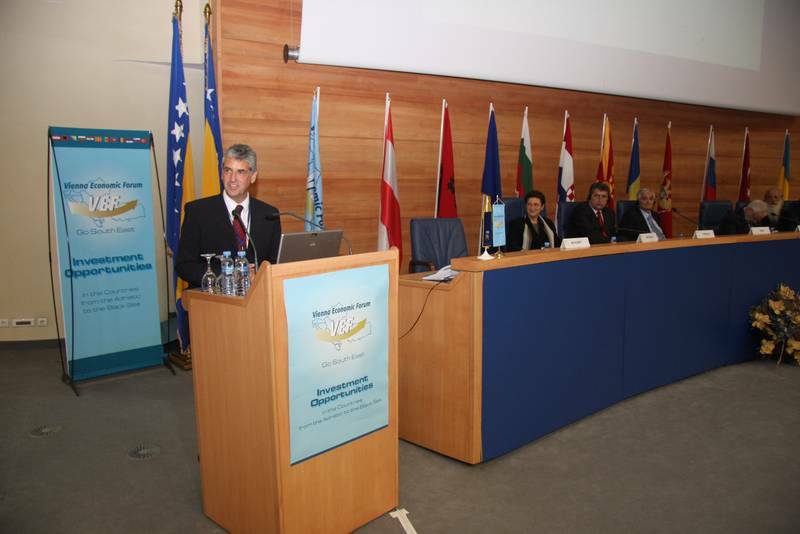 An Opening Message was given by H.E. 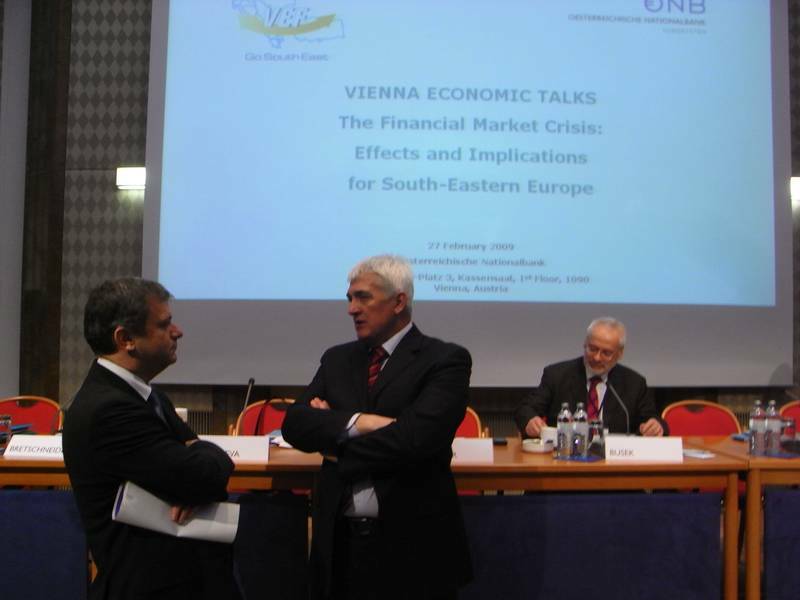 the Austrian Federal Chancellor Werner Faymann, who pointed out the importance of the South-East European region in the last 20 years after the fall of the Iron Curtain and the close cooperation with the Austrian economy. 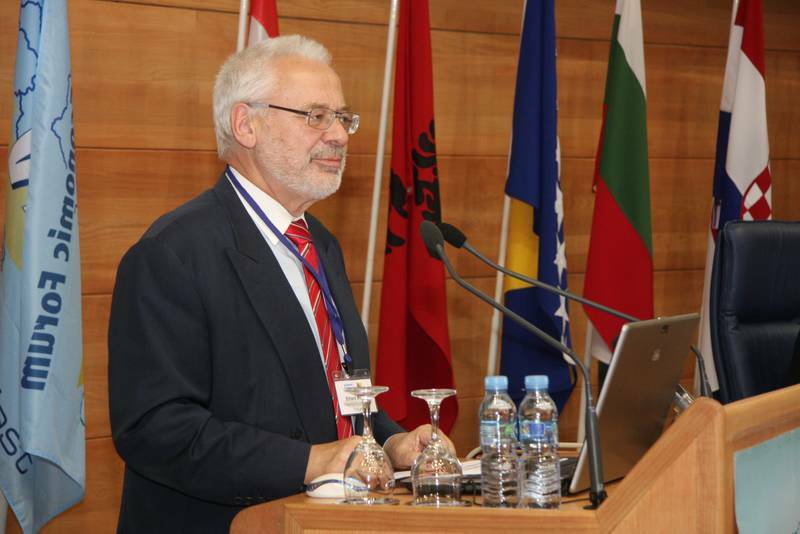 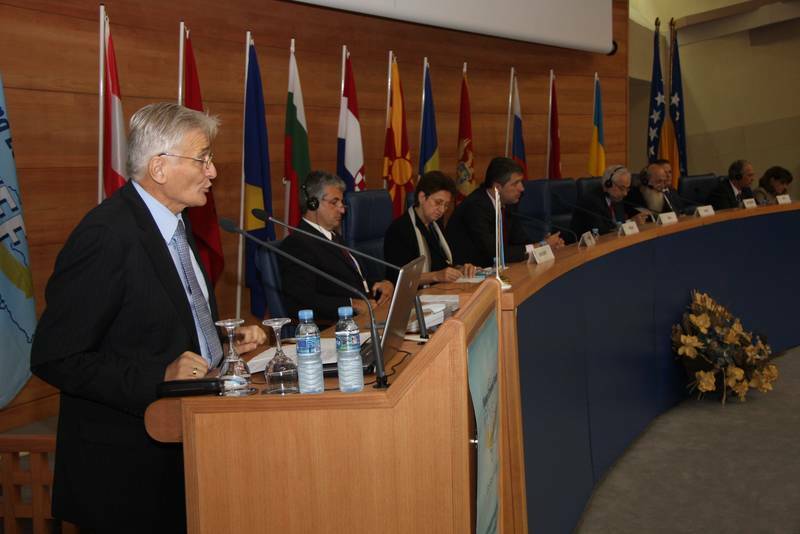 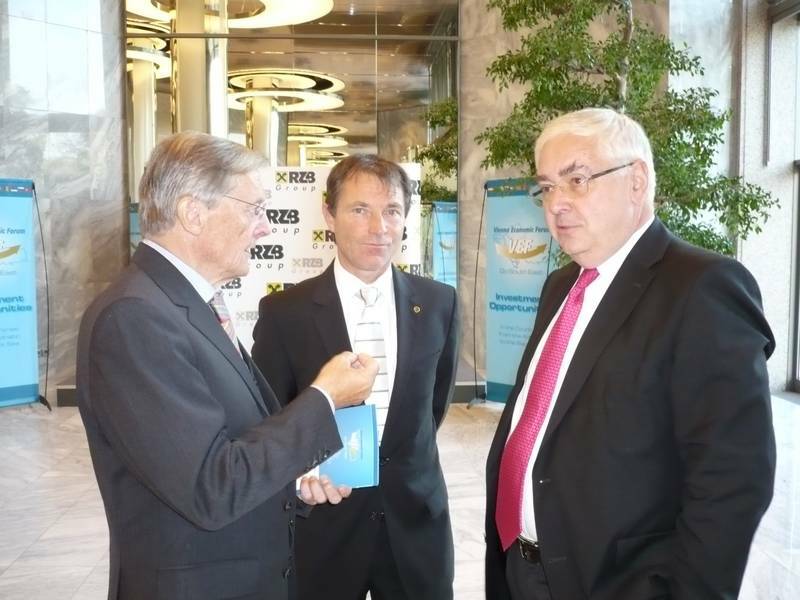 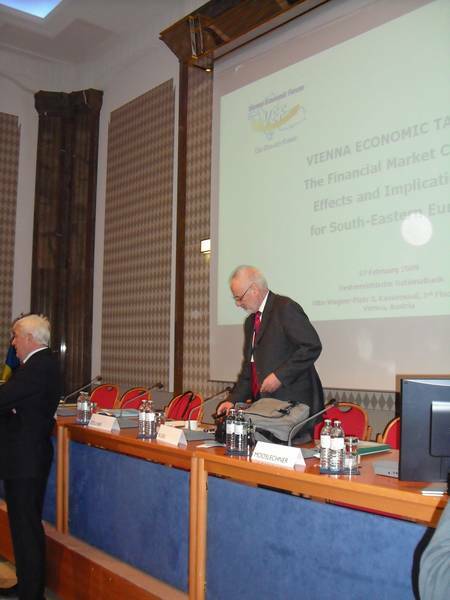 Dr. Erhard Busek, Former Vice Chancellor of Austria and President of Vienna Economic Forum underlined the necessity of regional cooperation for the countries of South-Eastern Europe. 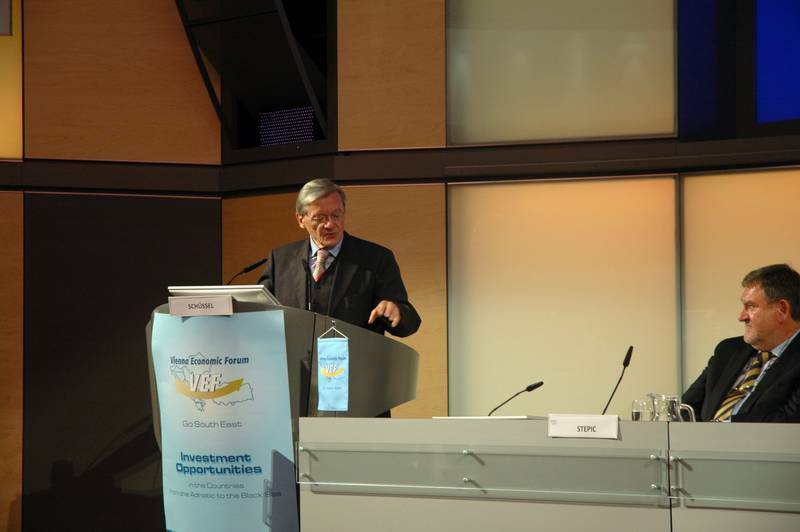 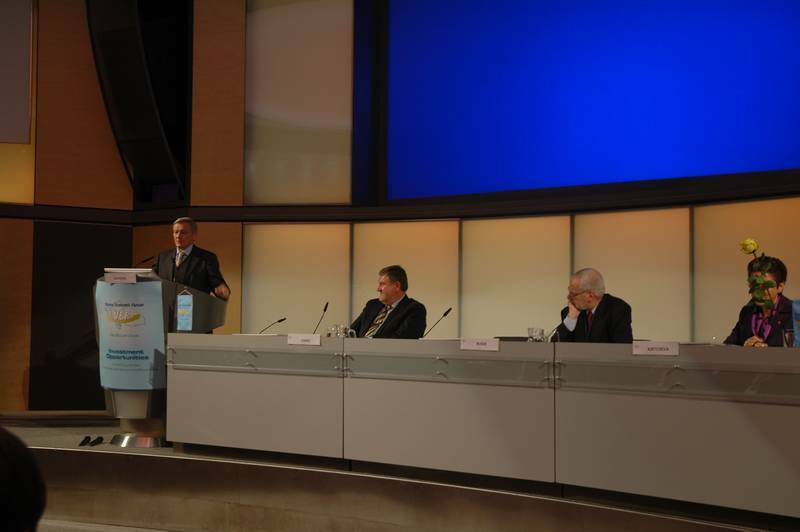 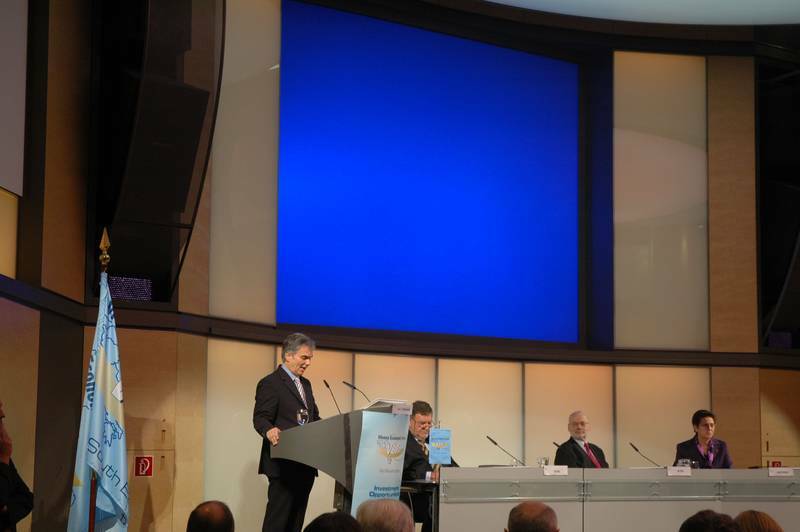 A welcome Address was given by Dr. Herbert Stepic, Chairman of Raiffeisen International Bank-Holding AG, Vice Chairman of RZB AG and Member of the Board of Vienna Economic Forum, who hosted the Forum again this year. 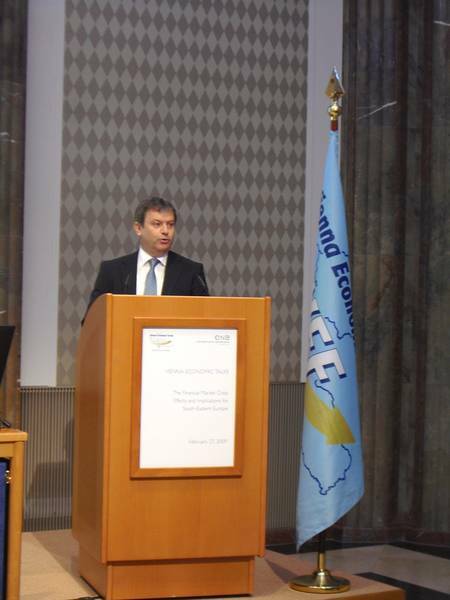 Dr. Stepic mentioned that the countries from the region have successfully changed in the last 20 years, and that they can trust in their partners. 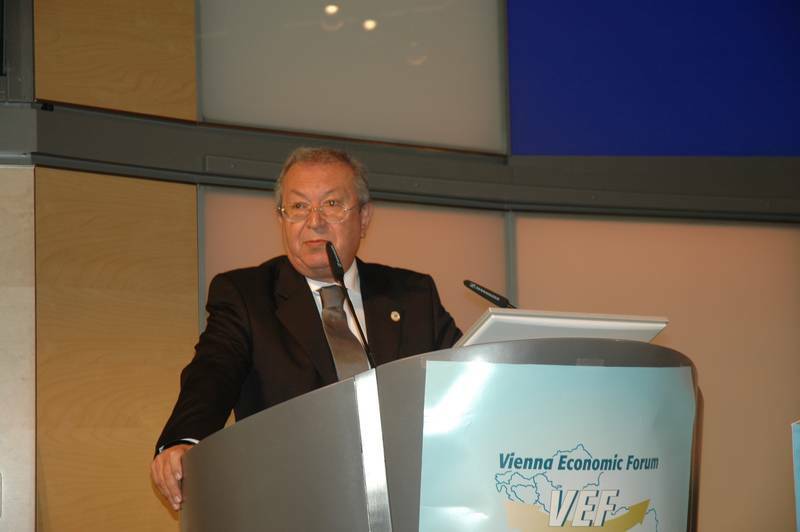 Congratulations came from Dr. Veit Sorger, President of the Federation of Austrian Industry and Founding Member of Vienna Economic Forum. 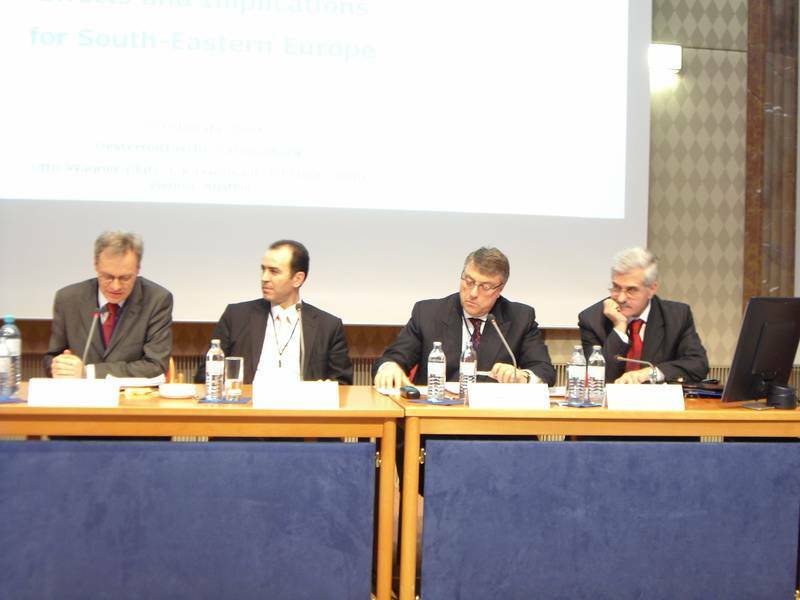 European perspective and a future EU membership as the driving force for the political and economic development of South-East Europe. 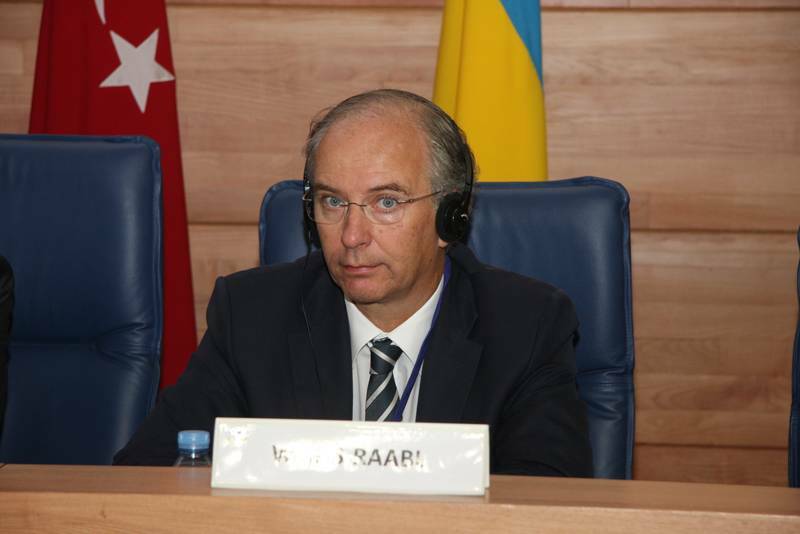 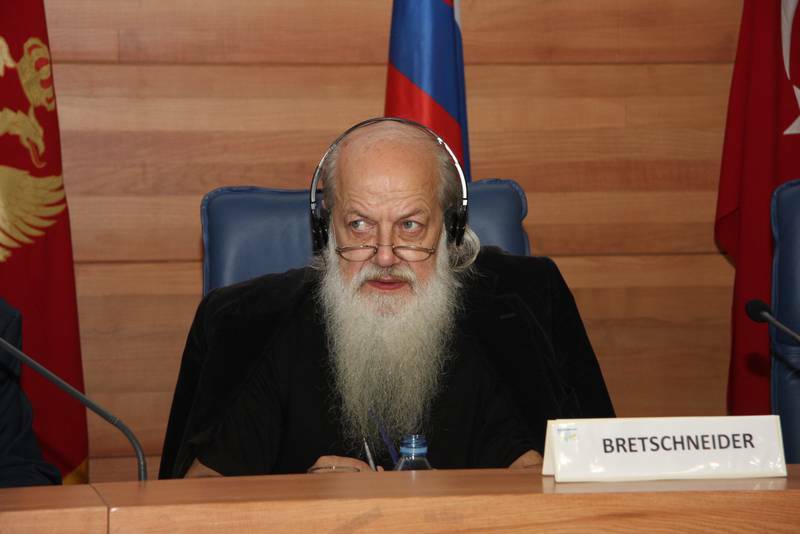 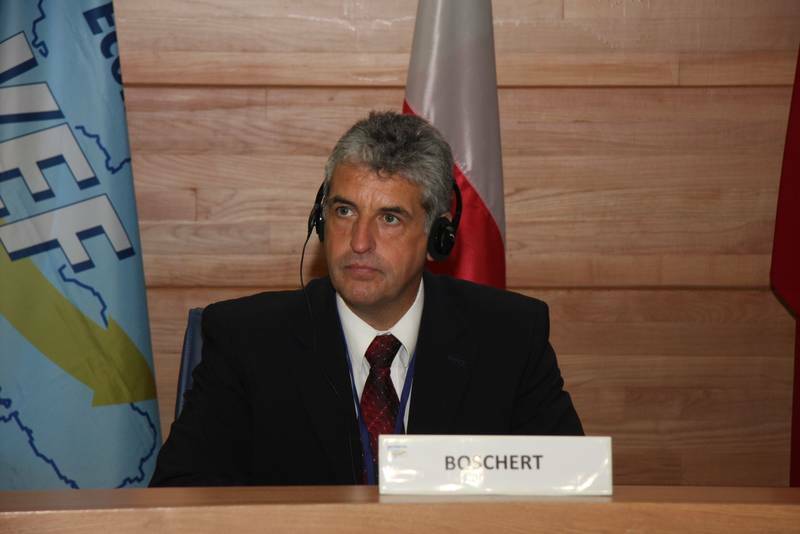 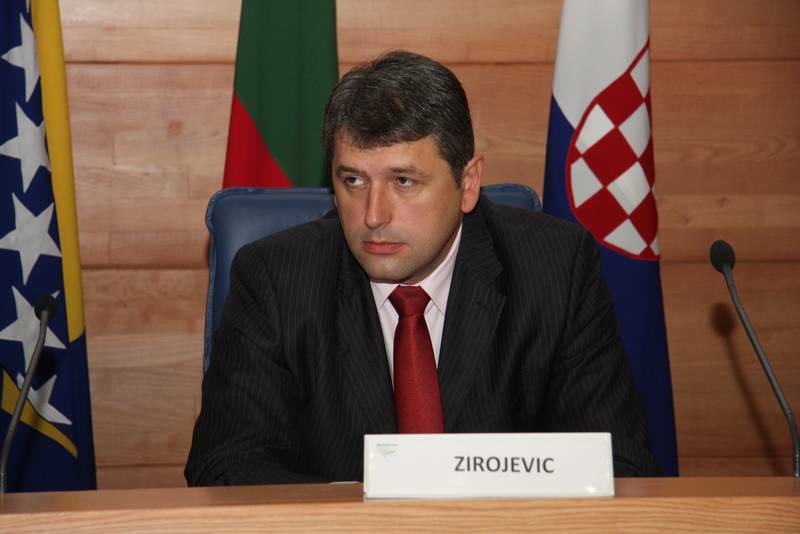 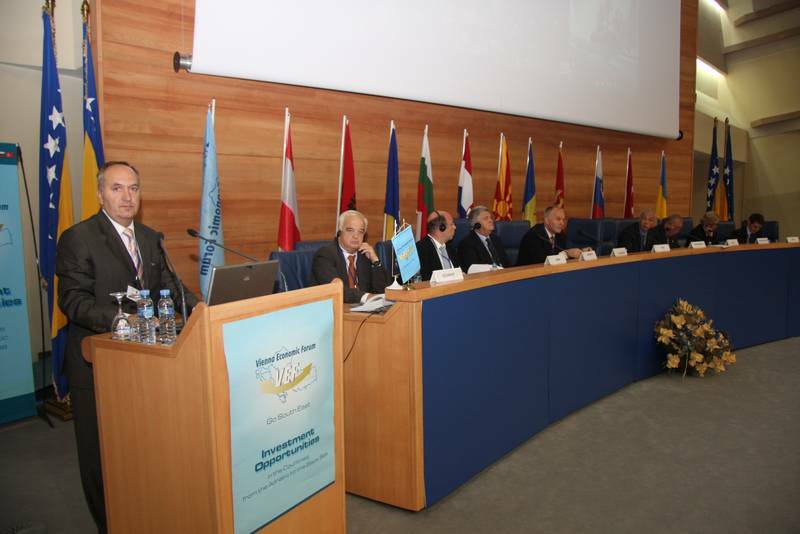 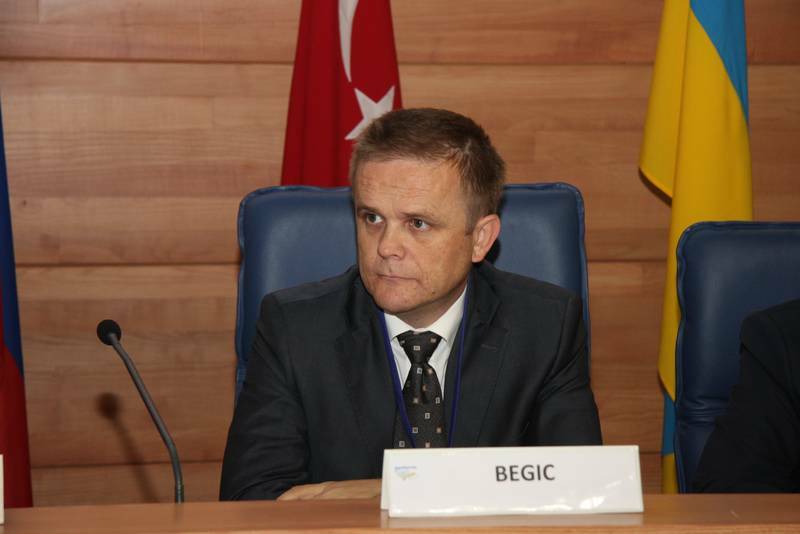 Further speaking during the first Plenary Session were Mr. Hidajet Biscevic, Secretary General of the South East European Cooperation Process (SEECP) and Regional Cooperation Council. 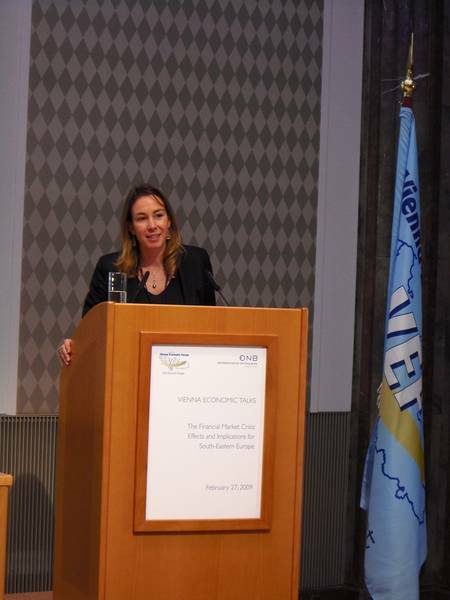 It was a pleasure for Vienna Economic Forum to welcome so many important Ministers, Deputy Ministers and high-ranking representatives from companies in Austria and in the region. 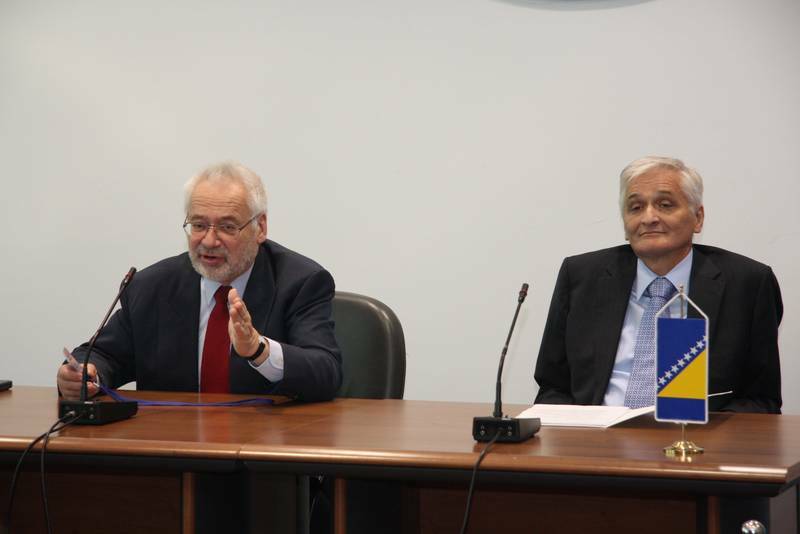 Furthermore, Ceremonies of Signing a Memorandum of Understanding with Mr. F. Sadi Gücüm of DEIK, Foreign Economic Relations Board of Turkey, and Dr. Milan Parivodic, Chairman of Foreign Investors Services d.o.o., Serbia, were held. 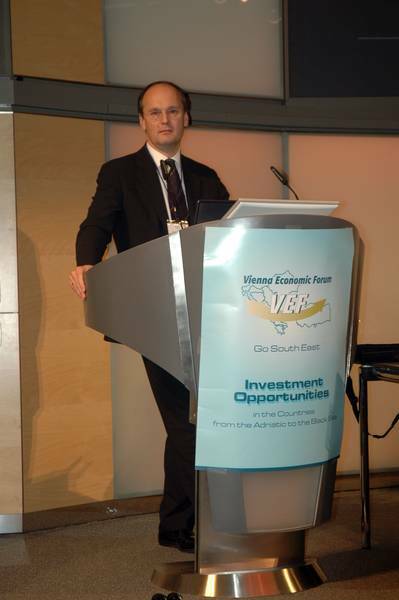 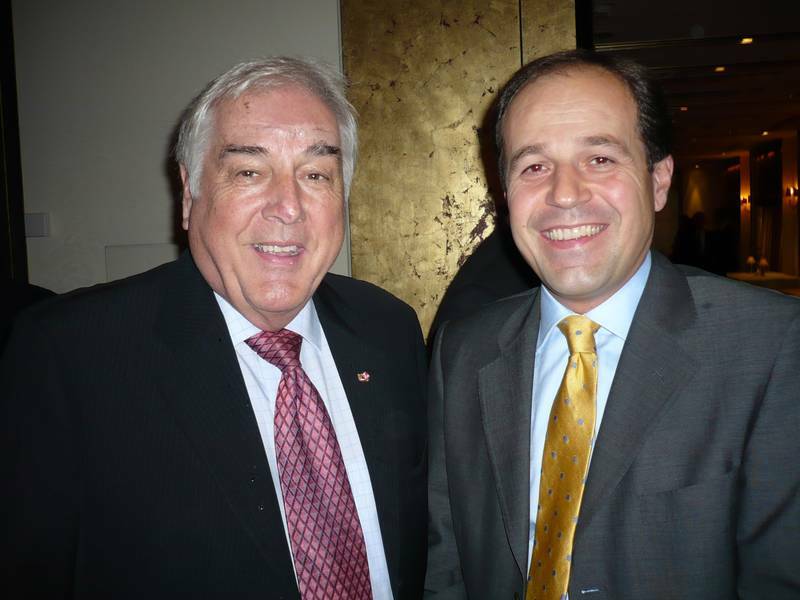 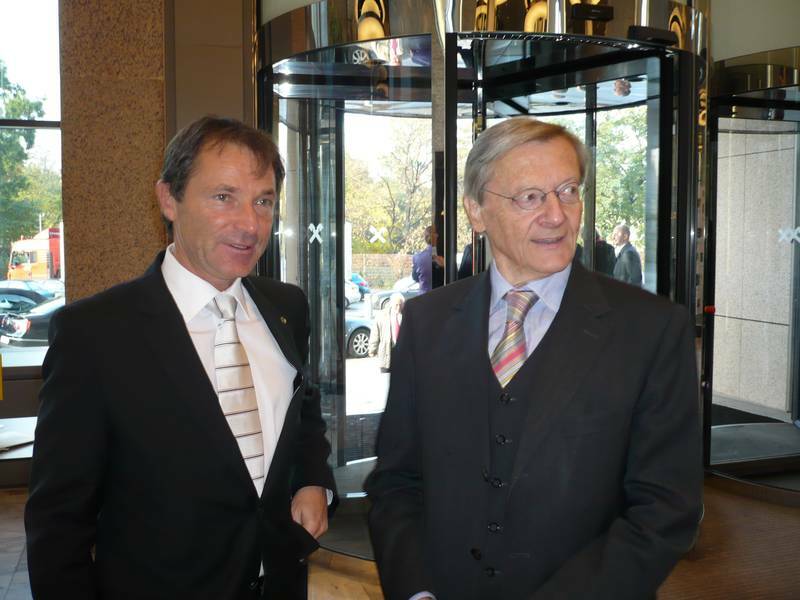 Dr. Veit Sorger, President of the Federation of Austrian Industries and Founding Member of Vienna Economic Forum, for his years of consequent and active participation in the investment processes in the countries of Vienna Economic Forum. 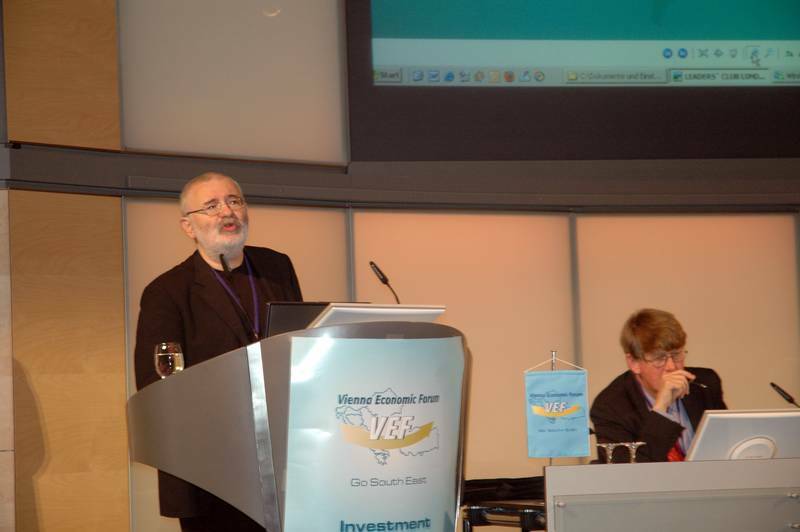 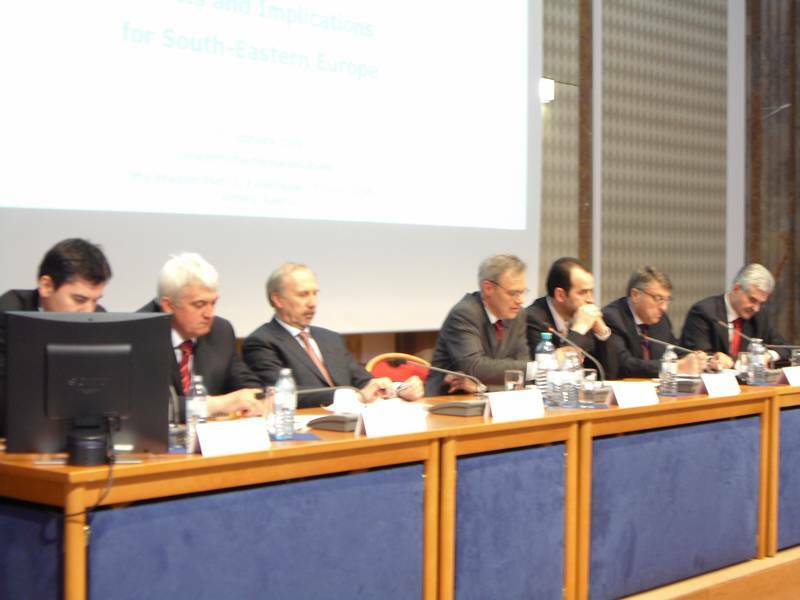 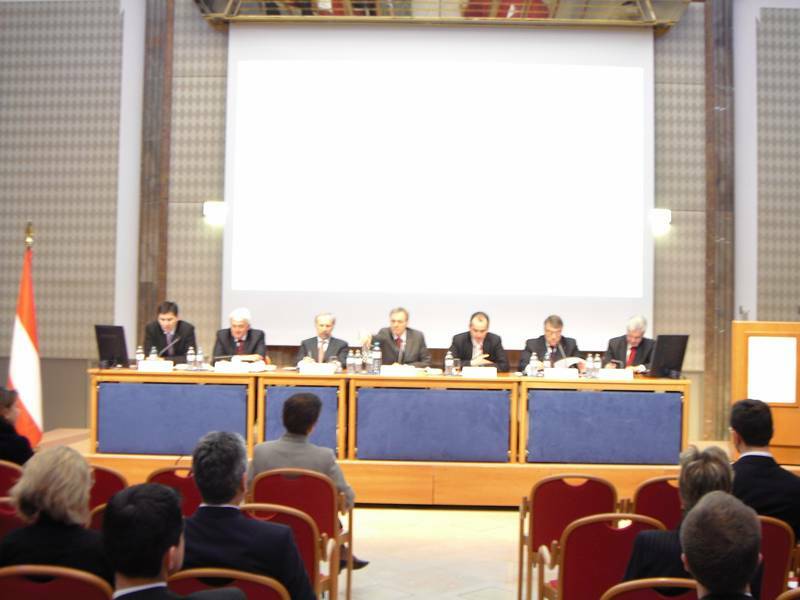 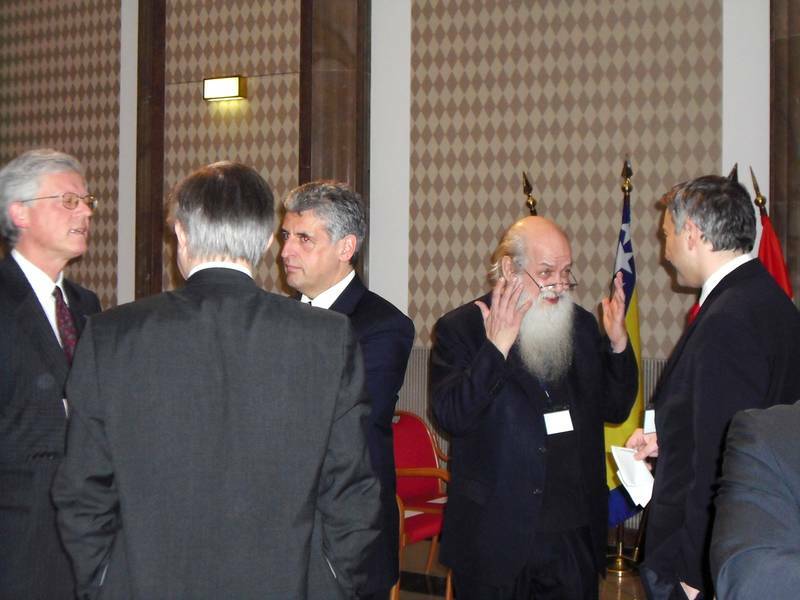 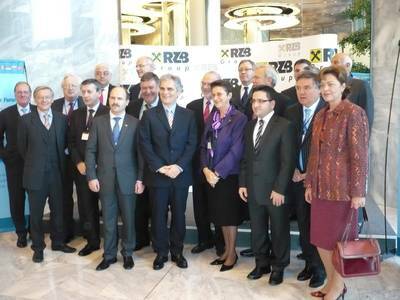 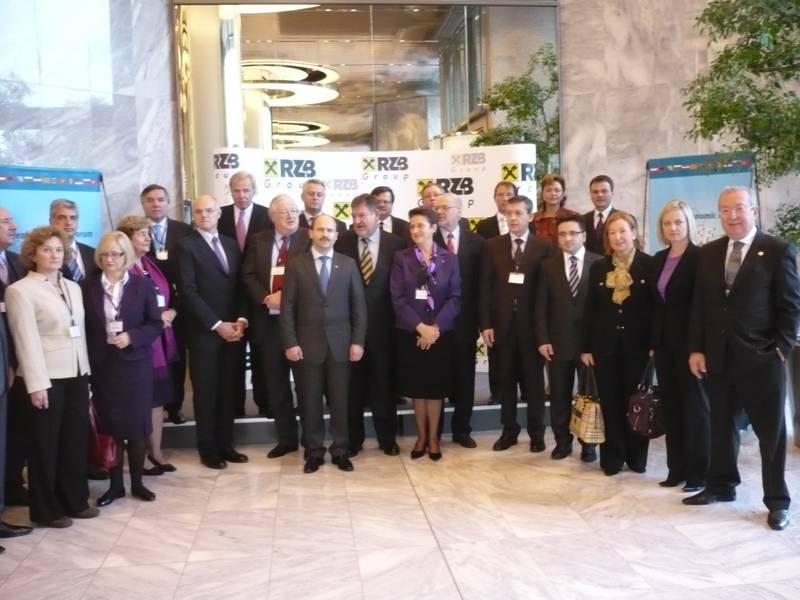 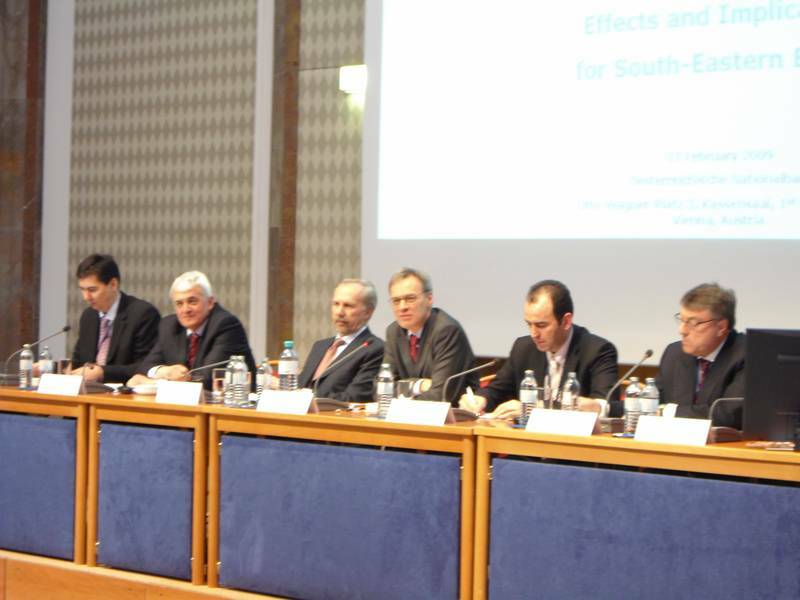 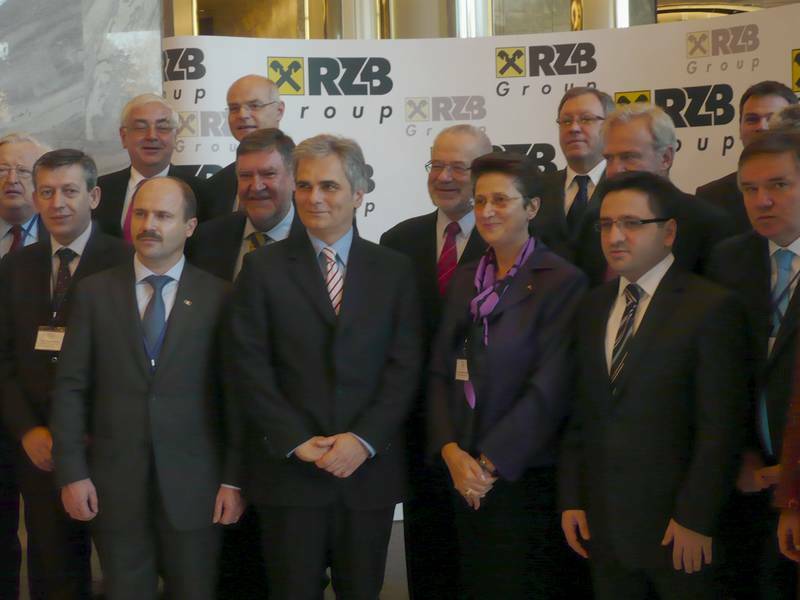 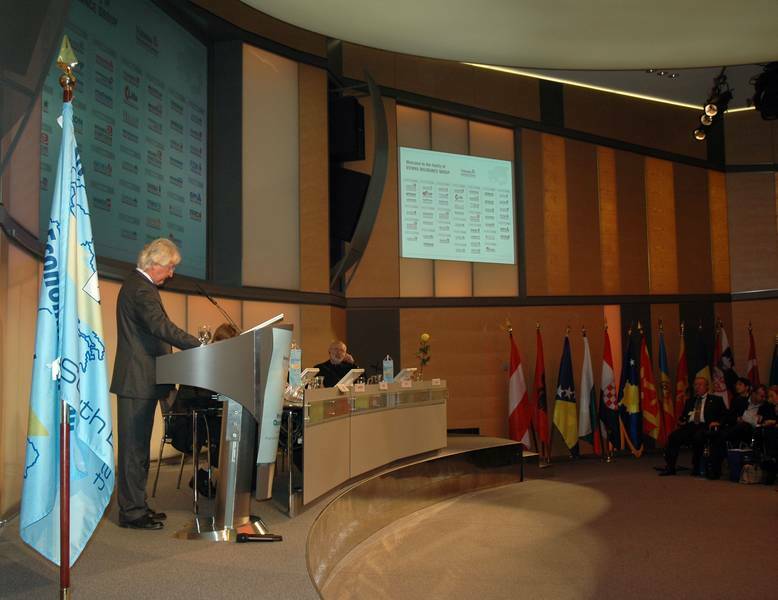 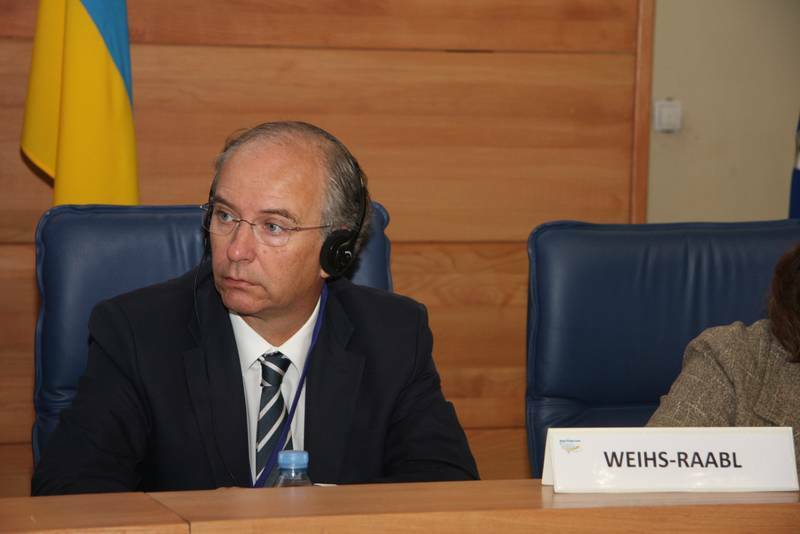 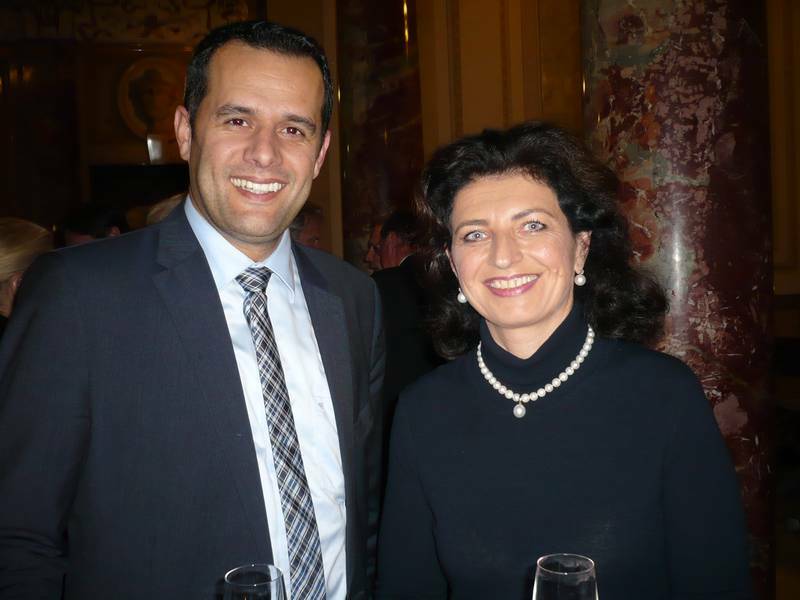 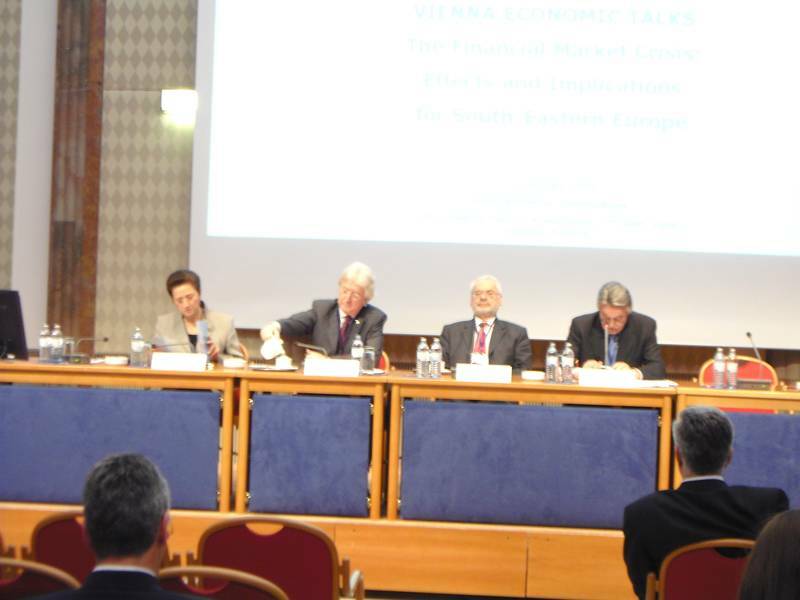 Vienna Economic Talks – Sarajevo Meeting successfully took place under the Patronage of H.E. 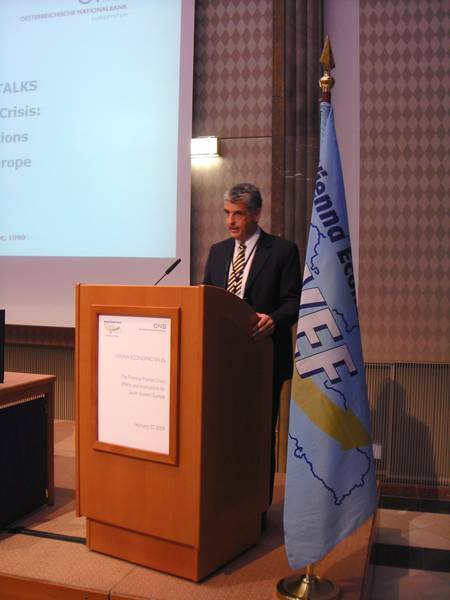 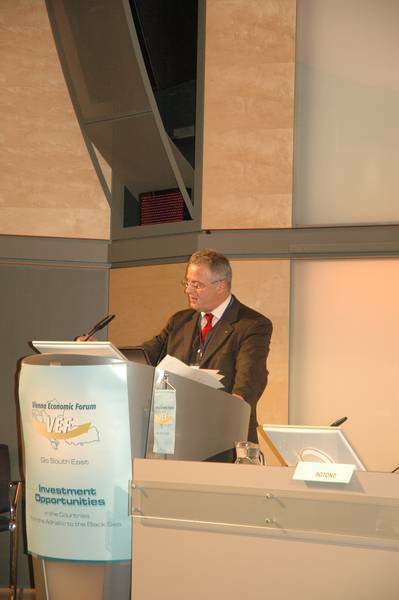 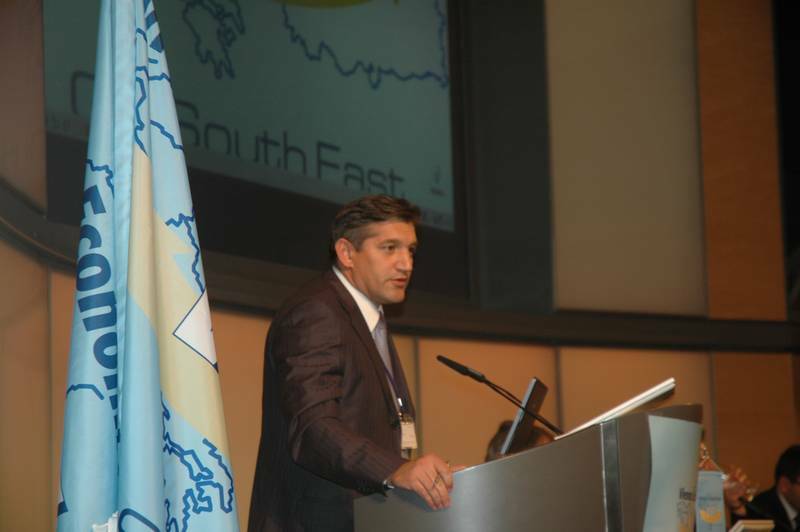 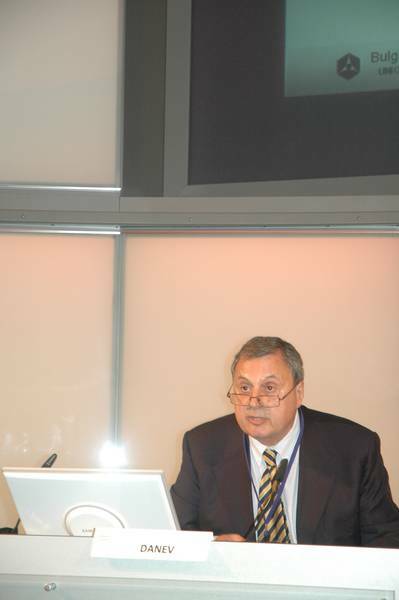 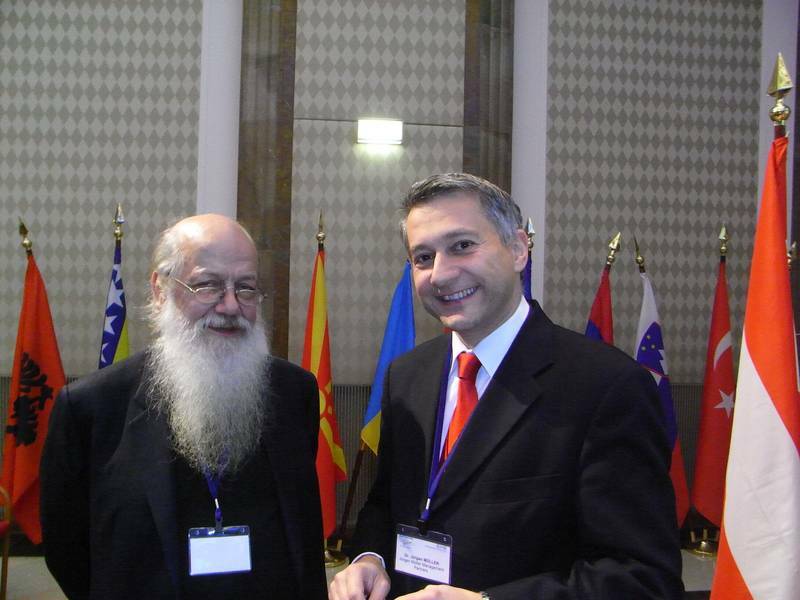 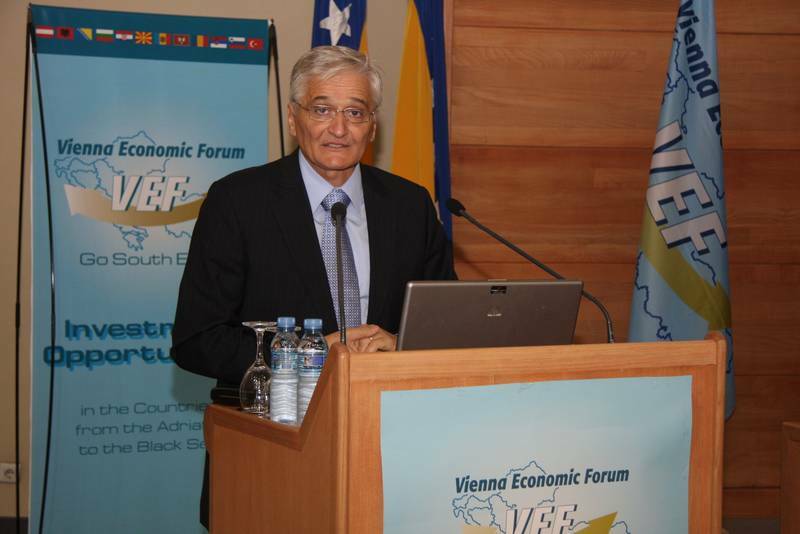 Dr. Nikola Spiric, Chairman of the Council of Ministers of Bosnia and Herzegovina, Patron of Vienna Economic Forum. 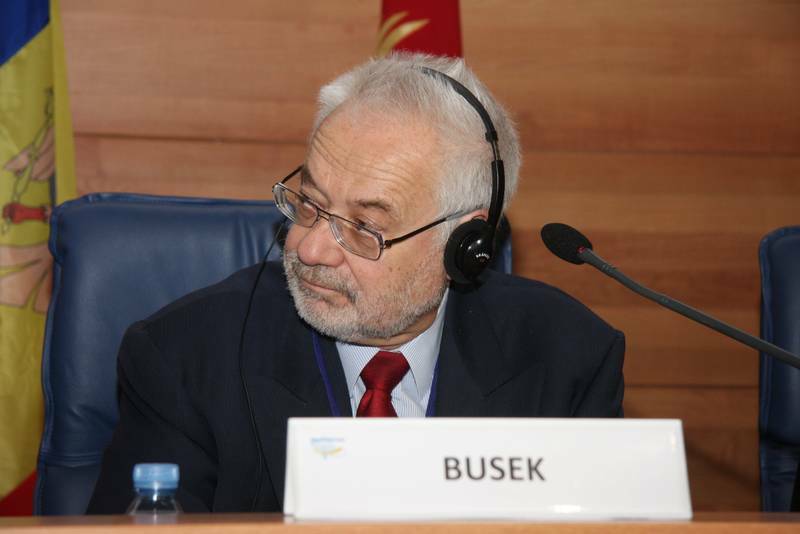 Dr. Erhard Busek, Former Vice-Chancellor of the Republic of Austria and President of Vienna Economic Forum and Secretary General Amb. 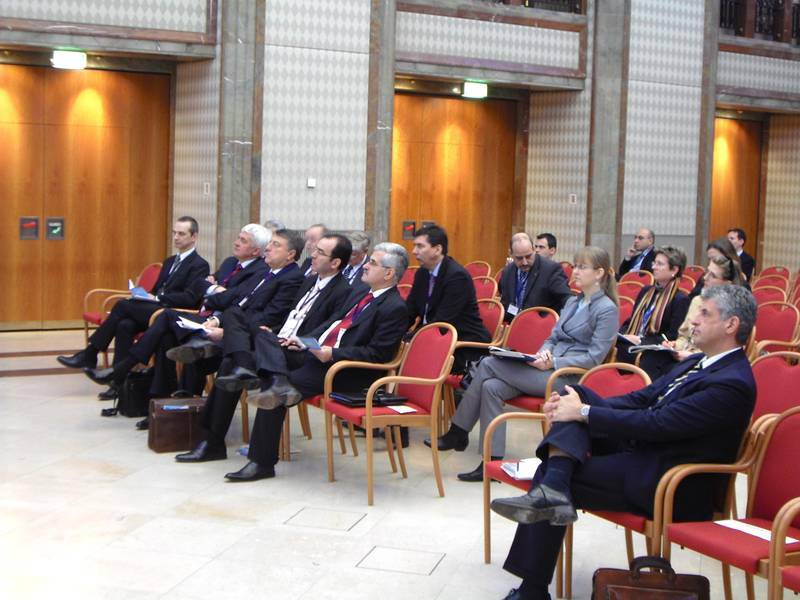 Dr. Elena Kirtcheva welcomed more than 200 participants from 21 countries and also from the European Bank for Reconstruction and Development (EBRD), the International Monetary Fund (IMF), the Regional Cooperation Council (RCC), Österreichische Kontrollbank AG, and World Bank. 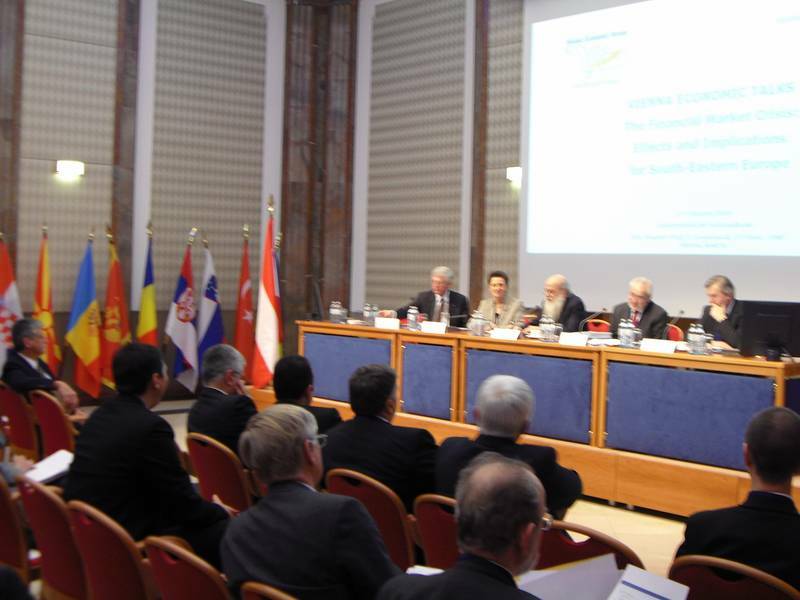 In his speech, Prime Minister Dr. Nikola Spiric said, "I am convinced that regional cooperation will accelerate path of the countries of the Region towards European Union (EU), in political, in economic and in infrastructural and in any other sense"
Impulse statements were given by H.E. 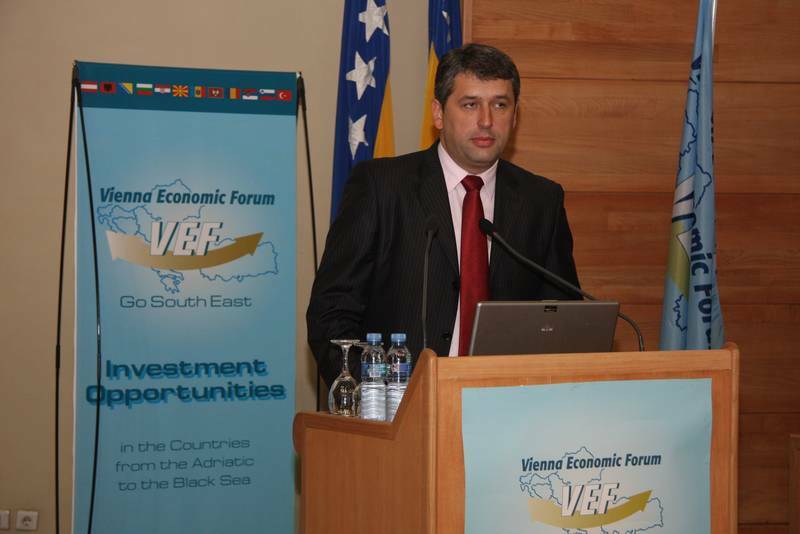 Mr. Dragan VRANKIC, Deputy Prime Minister of the Council of Ministers and Minister of Finance and Treasury of Bosnia and Herzegovina, H.E. 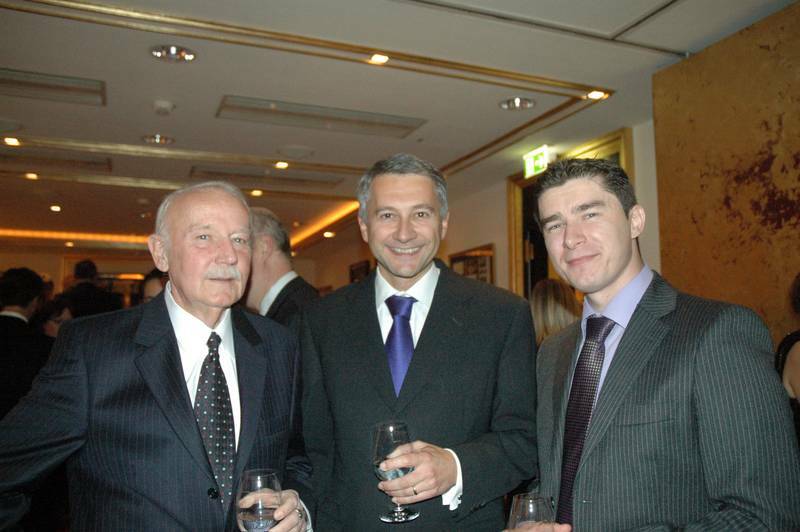 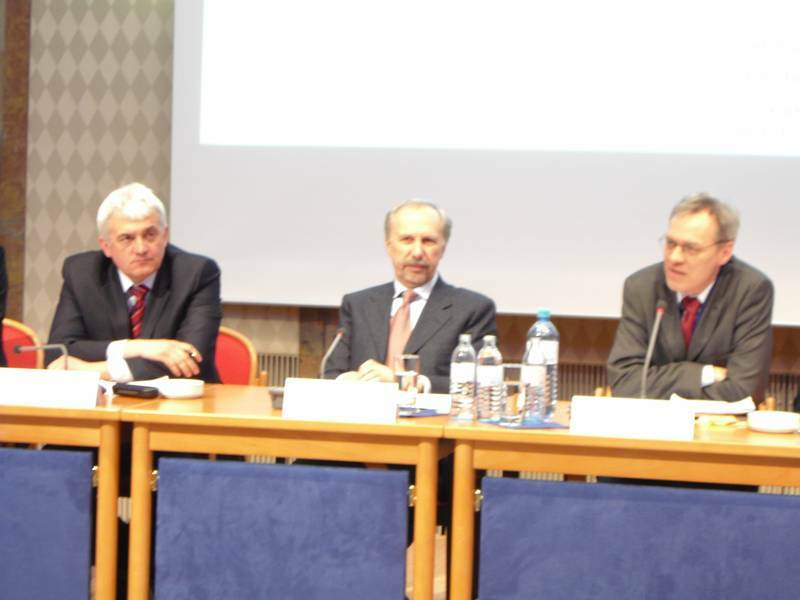 Ambassador Dr. Valentin Inzko, the High Representative and EU Special Representative in Bosnia and Herzegovina, and Mr. Kemal KOZARIC, Governor of the Central Bank of Bosnia and Herzegovina, Member of the Governors Committee of Vienna Economic Forum. 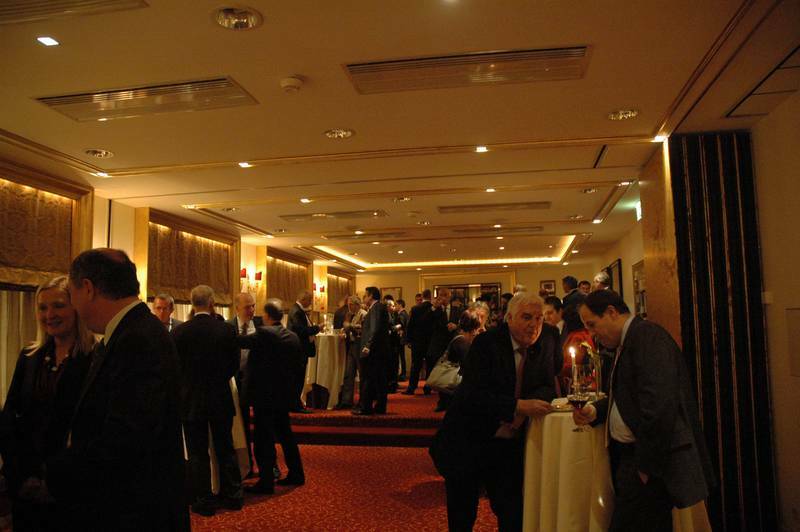 Around 70 companies from the region and 20 companies from Austria participated, with Members of Vienna Economic Forum, including influential Austrian investors like Bären Batterie, CMS Reich-Rohrwig-Hainz, Erste Group Bank AG, GfK Austria, Lansky Ganzger Partner, Siemens, Telekom Austria AG, mobilkom austria AG, UNIQA, Vienna Insurance Group, Volksbank International AG, Wolf Theiss, and also Dr. Akkan Suver, the President of Marmara Foundation of Turkey, partner of Vienna Economic Forum. 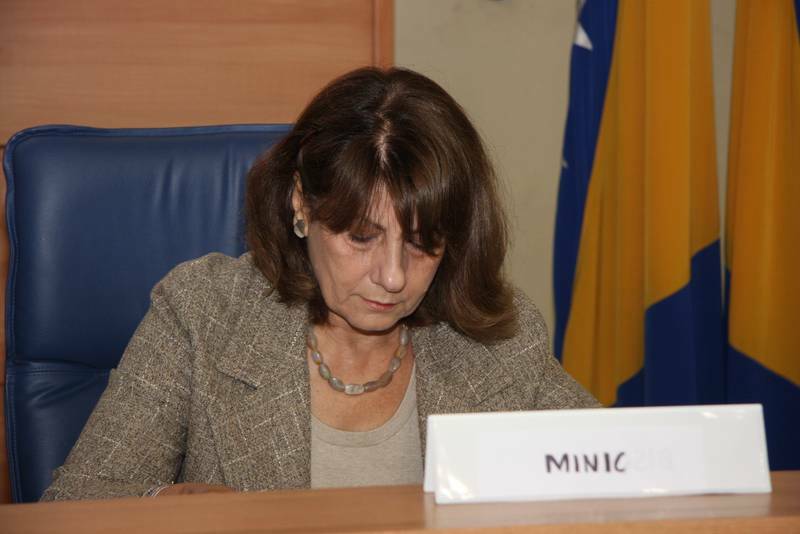 Secretary General Ambassador Dr. Elena Kirtcheva in her statement mentioned that for further development of Bosnia and Herzegovina’s economy it is very important to meet with the Austrian and other investors from the region, who came to discuss directly the opportunities for cooperation in all these fields, and that the government of Bosnia and Herzegovina gives priority to attracting investments. 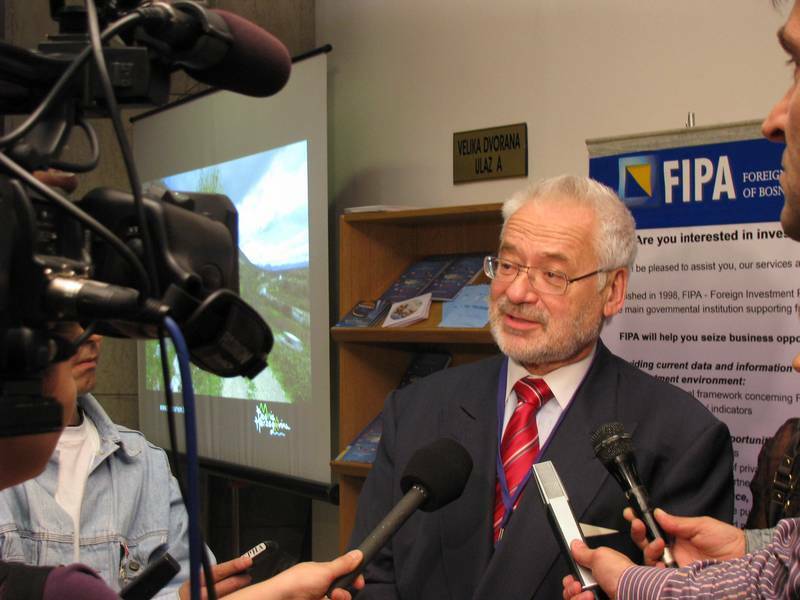 The President of Vienna Economic Forum Dr. Erhard Busek stated he is very pleased to see so many interested companies in Sarajevo who wish to install contacts and to exchange experience. 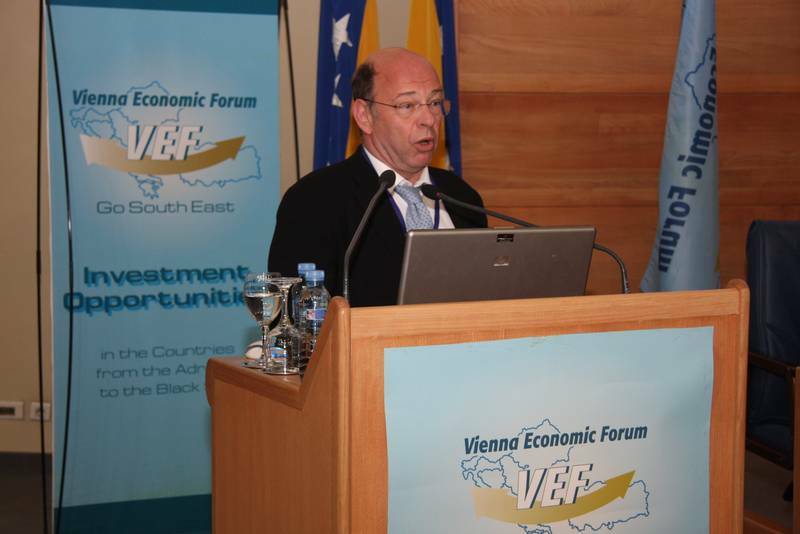 This all provides a good basis for further and more intensive cooperation, and the cooperation is a key word in the concept and in the vision of Vienna Economic Forum. 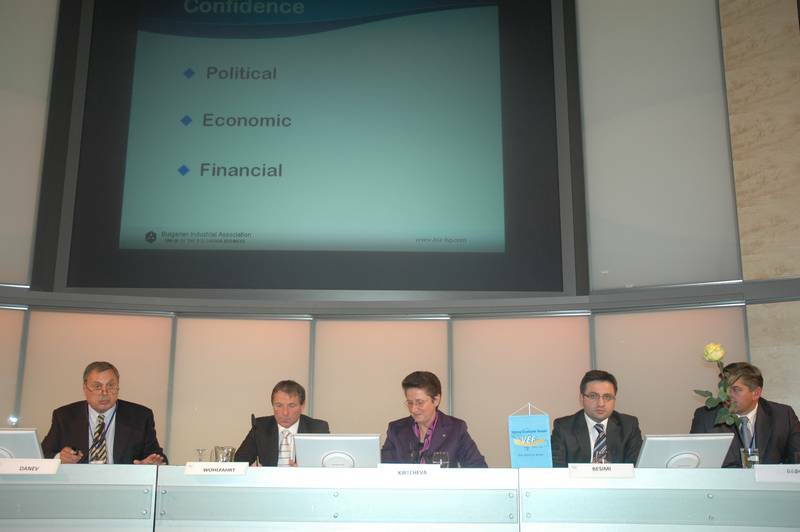 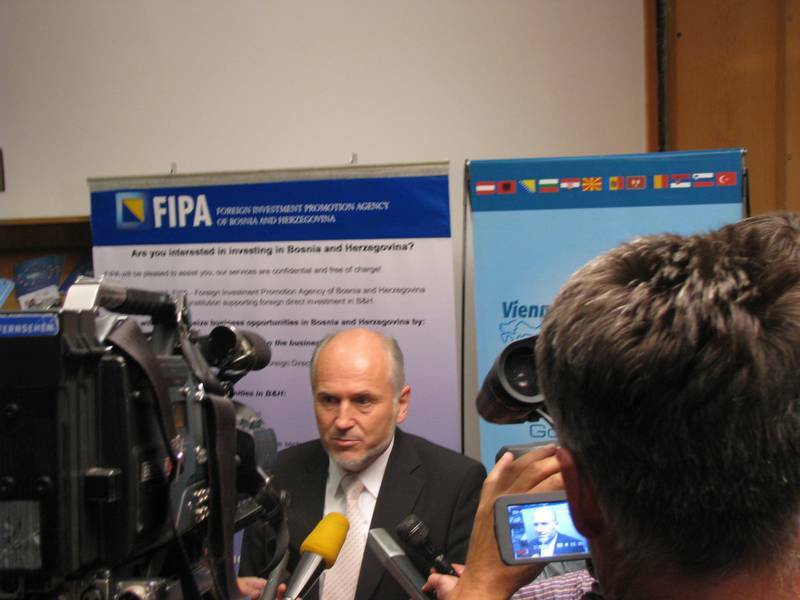 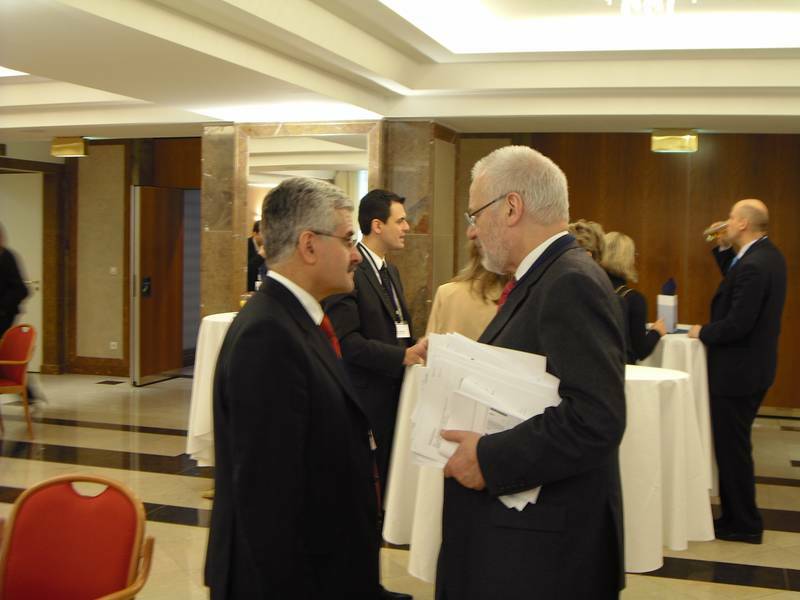 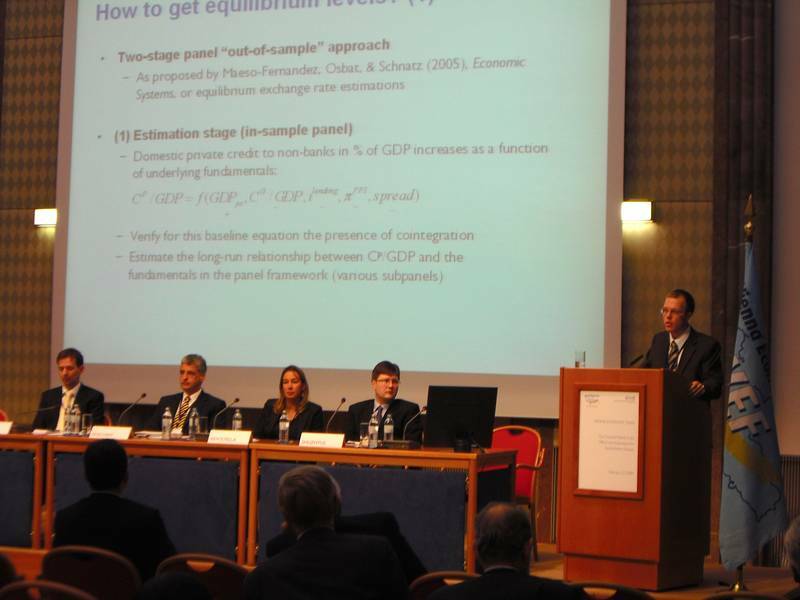 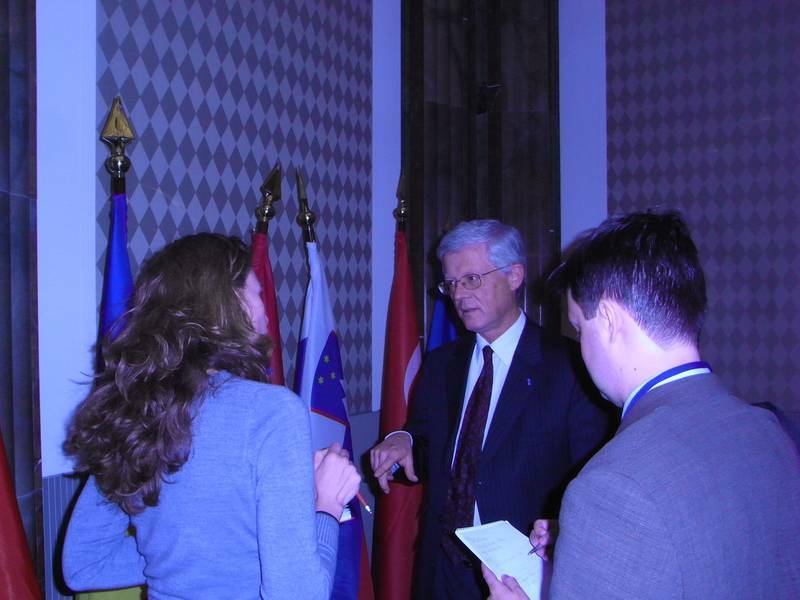 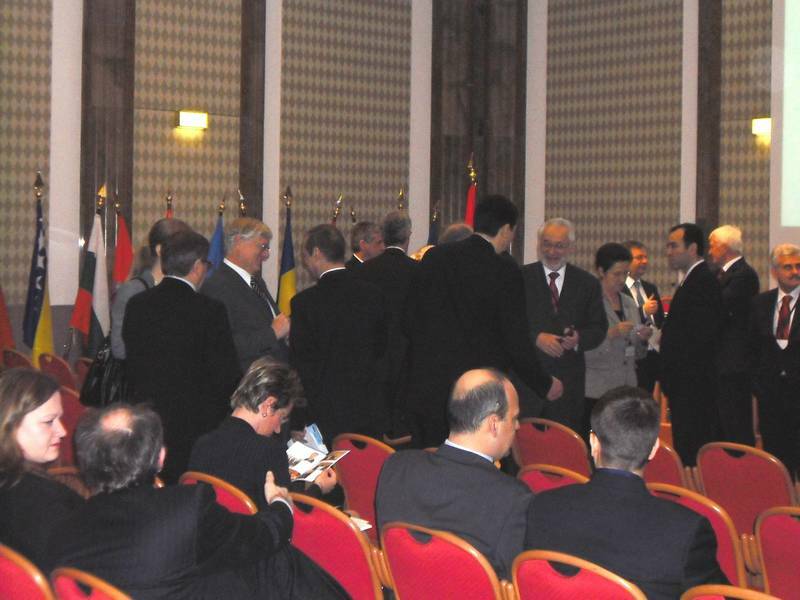 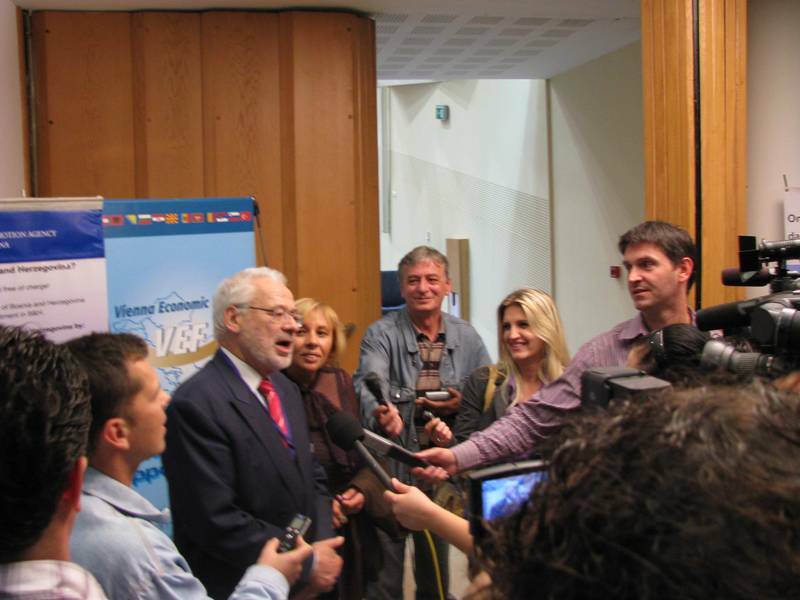 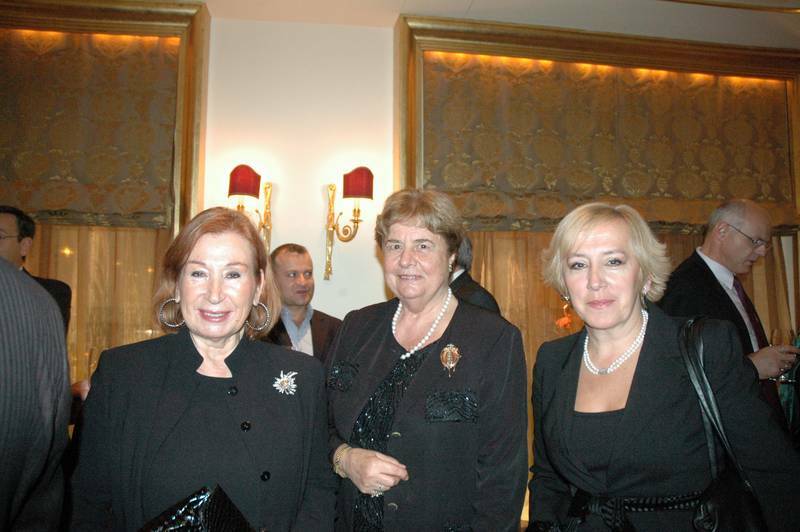 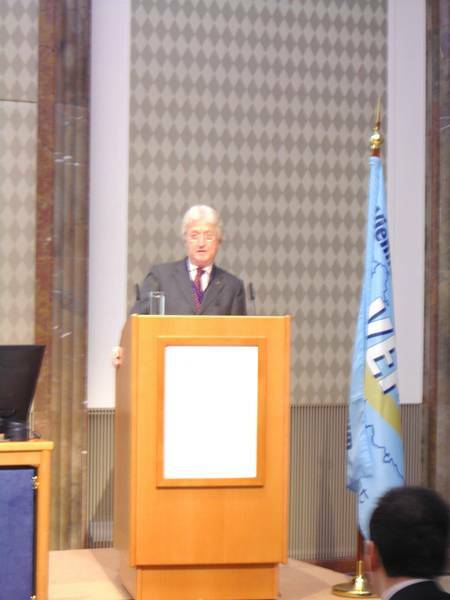 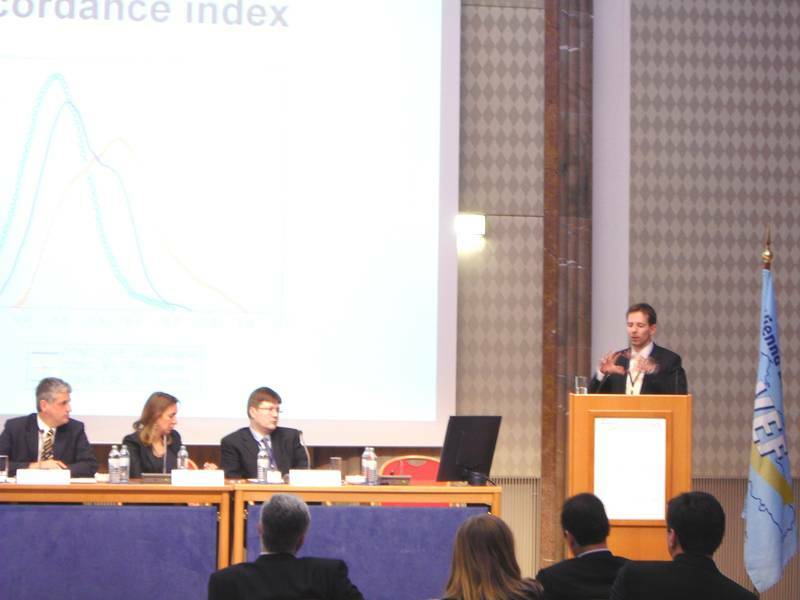 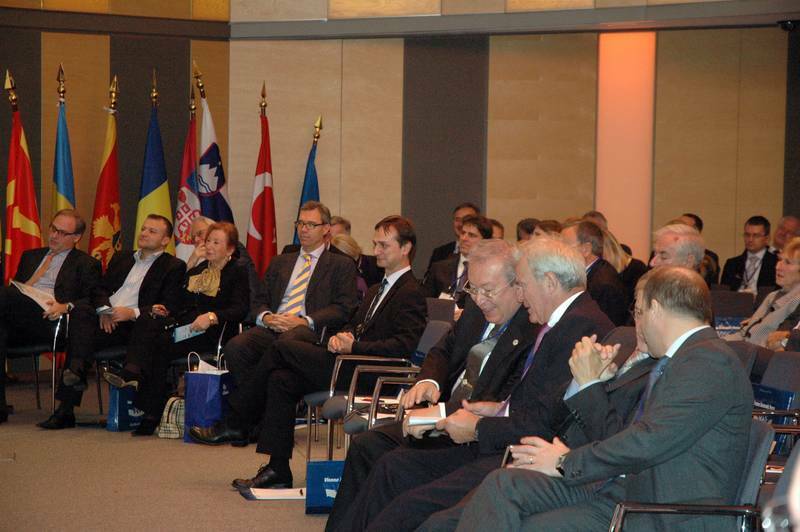 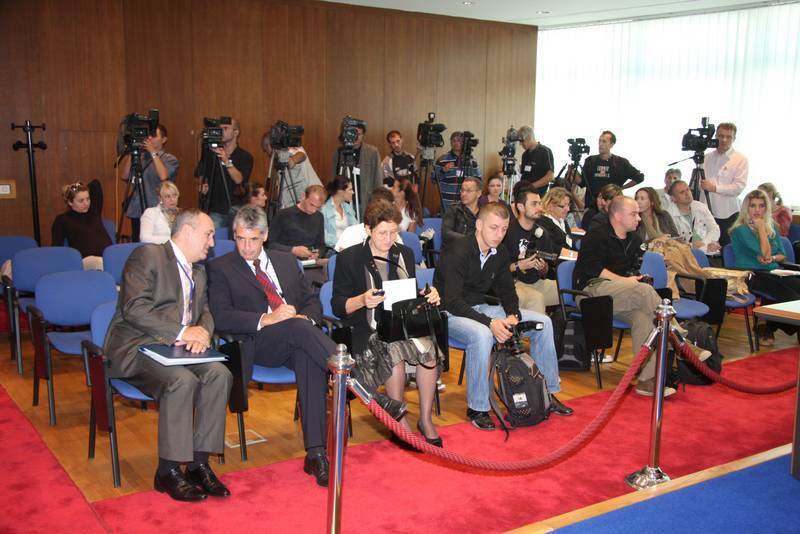 Vienna Economic Talks – Pristina Meeting was held on 25-26 March 2009 in Grand Hotel Pristina. 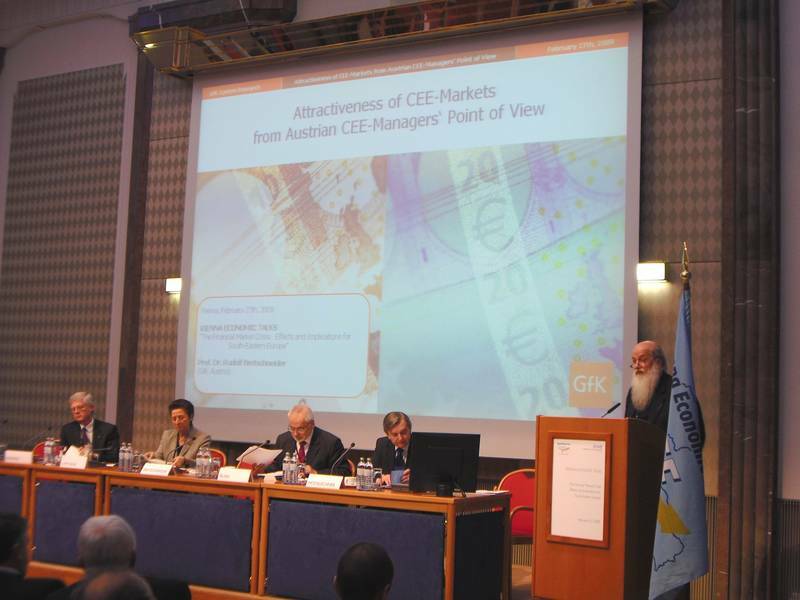 Dr. Erhard Busek, Former Vice-Chancellor of the Republic of Austria and President of Vienna Economic Forum and Secretary General Amb. 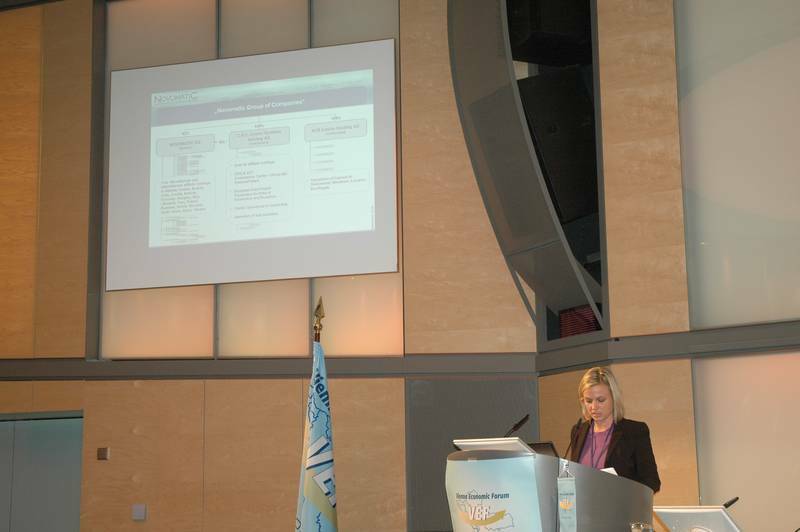 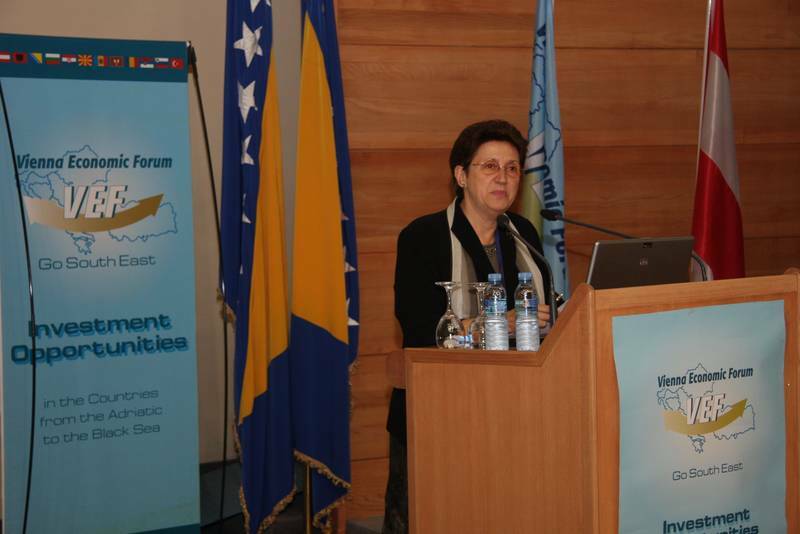 Dr. Elena Kirtcheva welcomed more than 180 participants from 19 countries and also from the Regional Cooperation Council (RCC), from the European Bank for Reconstruction and Development (EBRD), from the EU International Civilian Office, from the International Organization for Migration (IOM) and World Bank. 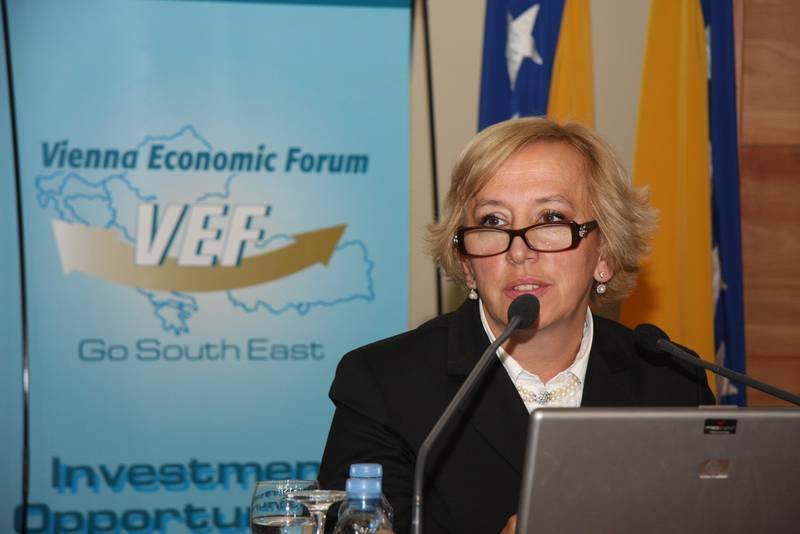 Secretary General Ambassador Dr. Elena Kirtcheva in her Statement mentioned the advantage that business growth is expected in the next years in Kosovo's energy and transportation infrastructure. 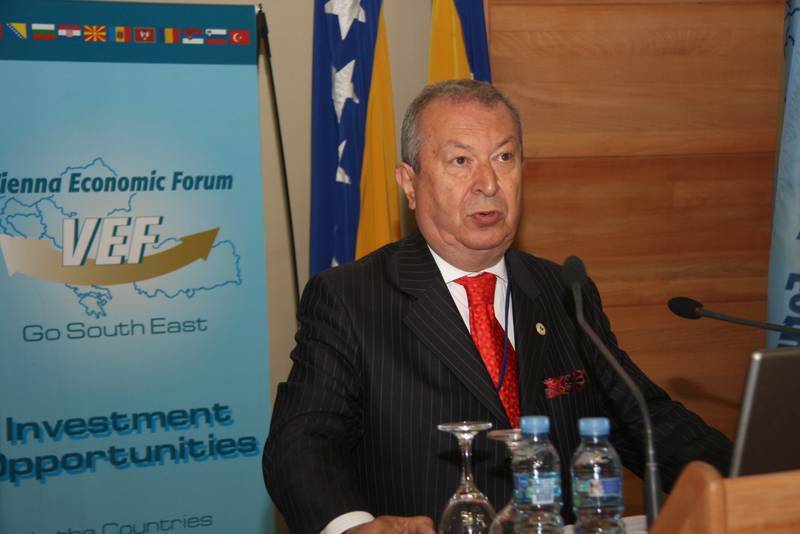 According to the latest news, Kosovo expects economic growth and is planning large privatizations. 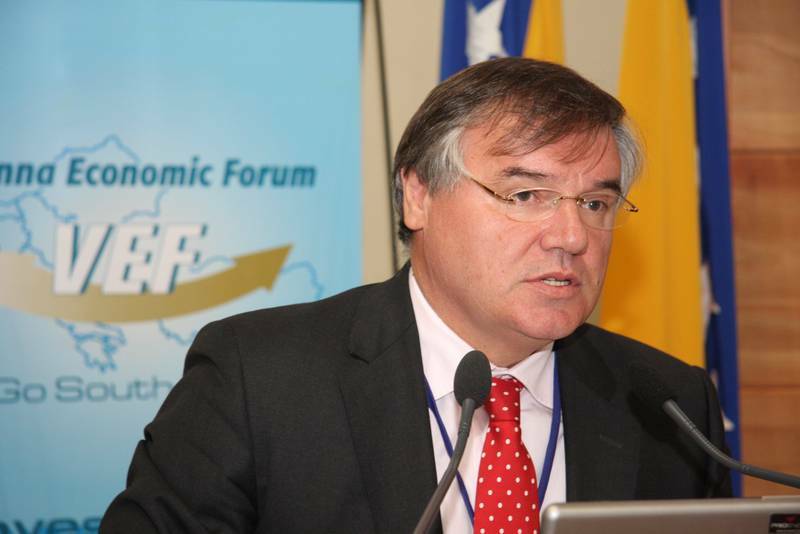 The government has turned Kosovo into one of the countries with the lowest tax burdens. 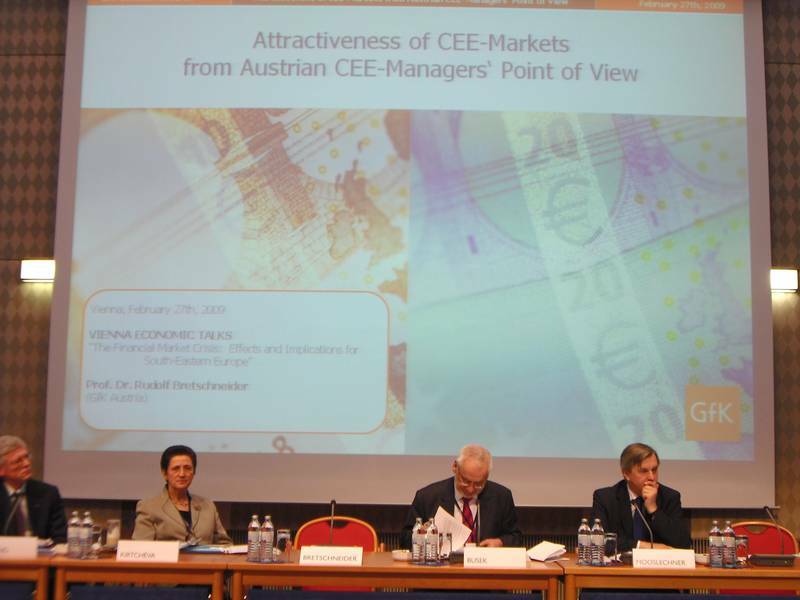 This all provides a good basis for further and more intensive Cooperation and the Cooperation is a key word in the concept and in the vision of Vienna Economic Forum. 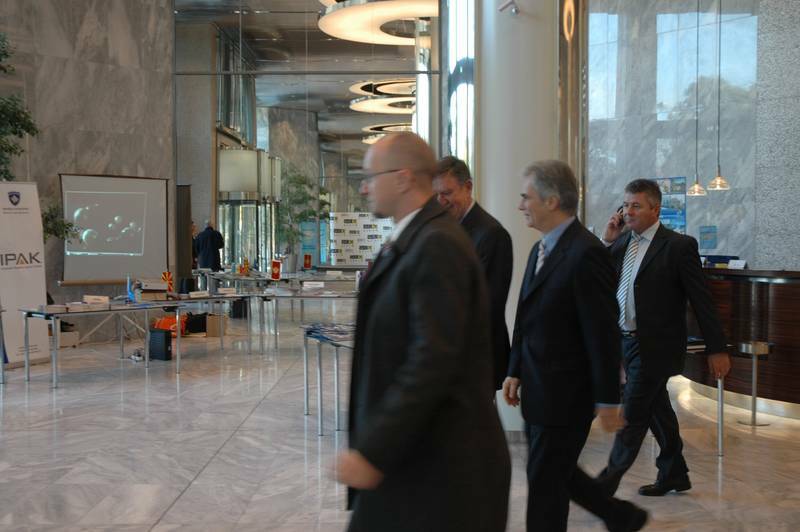 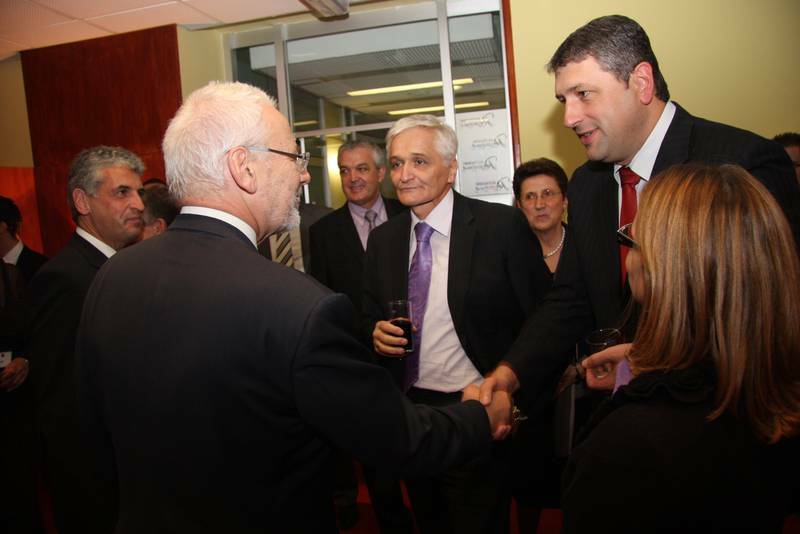 Kosovo has opened a good atmosphere for business and investment. 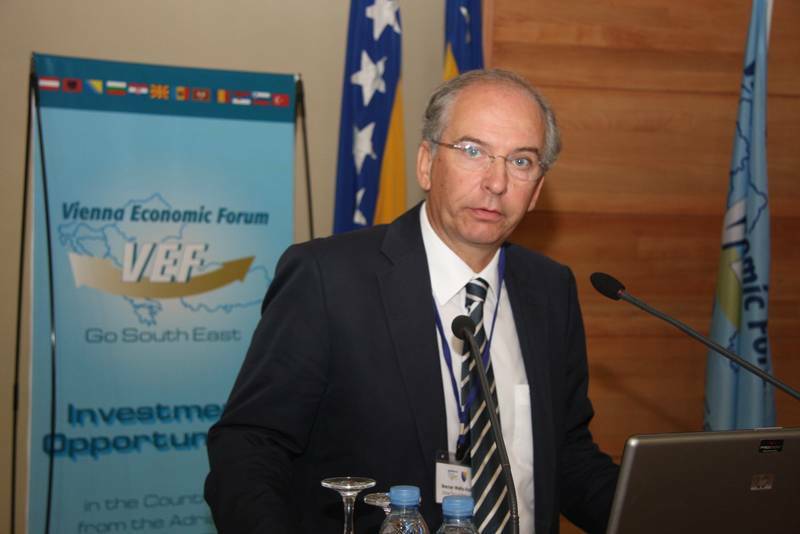 The President of Vienna Economic Forum Dr. Erhard Busek stated he is very pleased to see so many positive changes in Kosovo during the last few years. 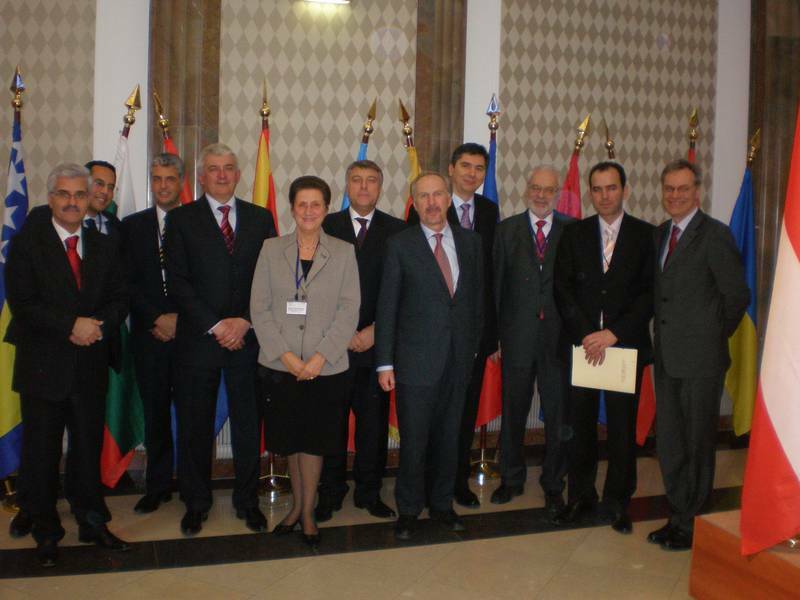 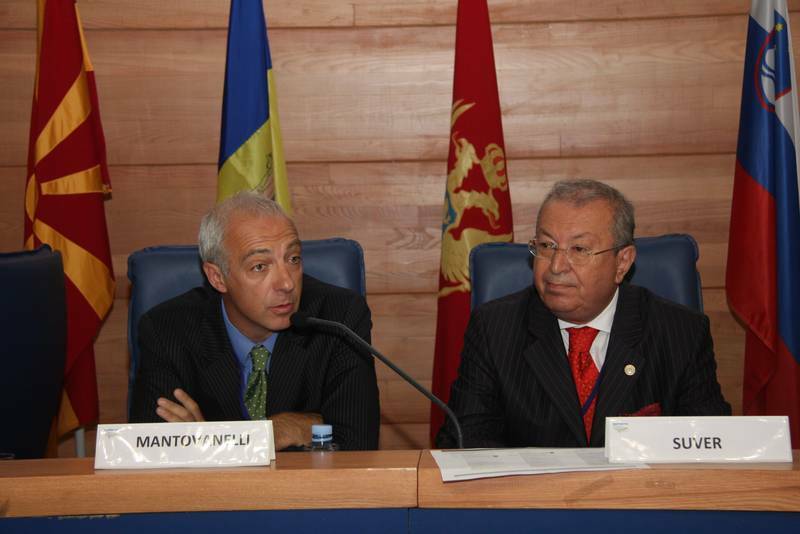 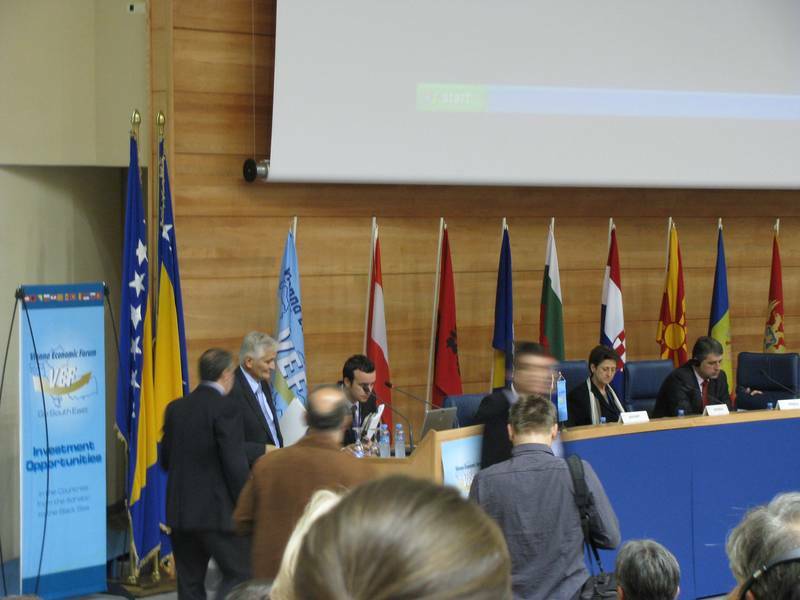 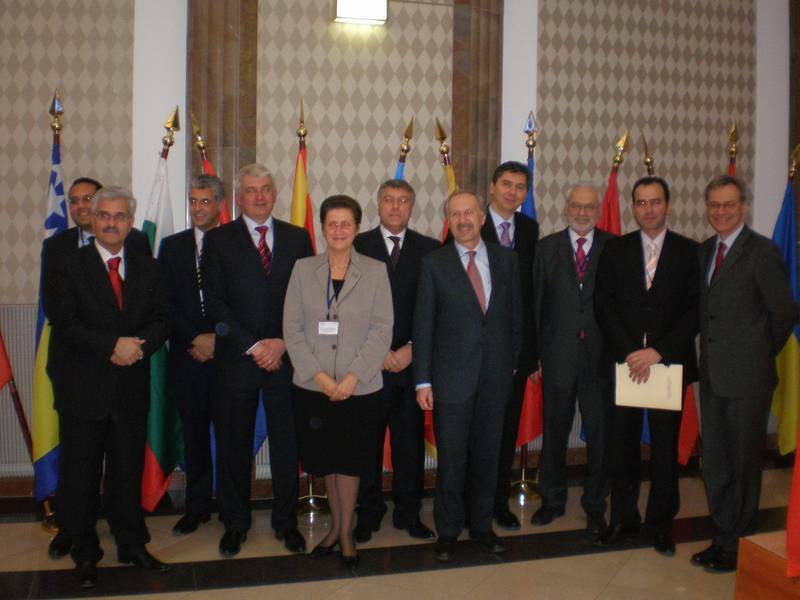 The Representatives of Kosovo Government, including H.E. 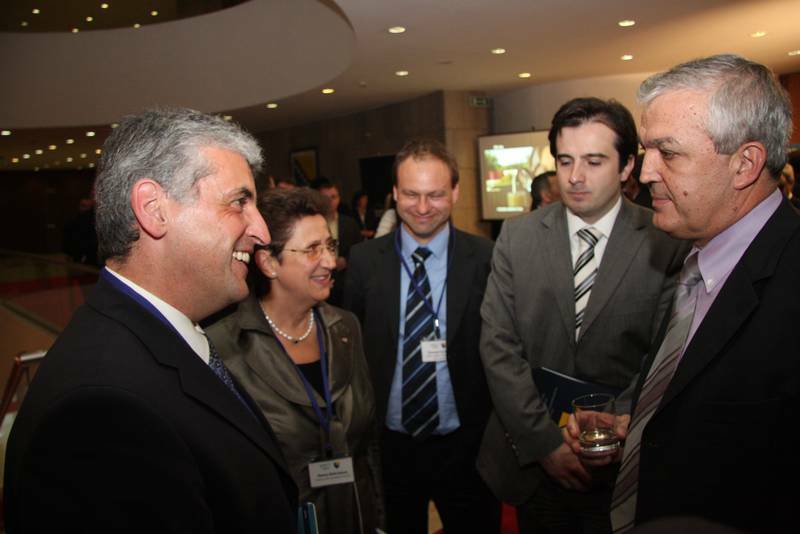 Prime Minister Thaci and Ministers of Trade and Industry, Transportation and Telecommunication, Energy and Mining, have invited foreign investors to invest in Kosovo and have guaranteed their commitment to further improving the investment climate. 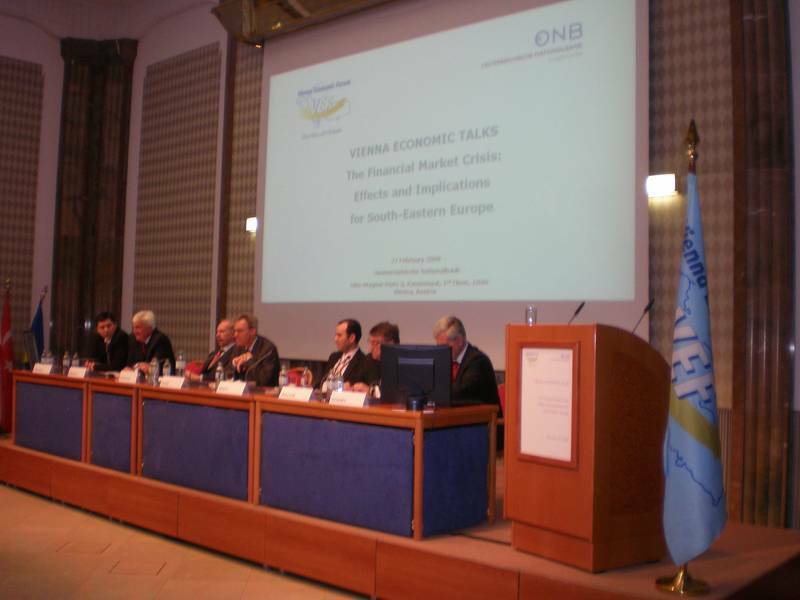 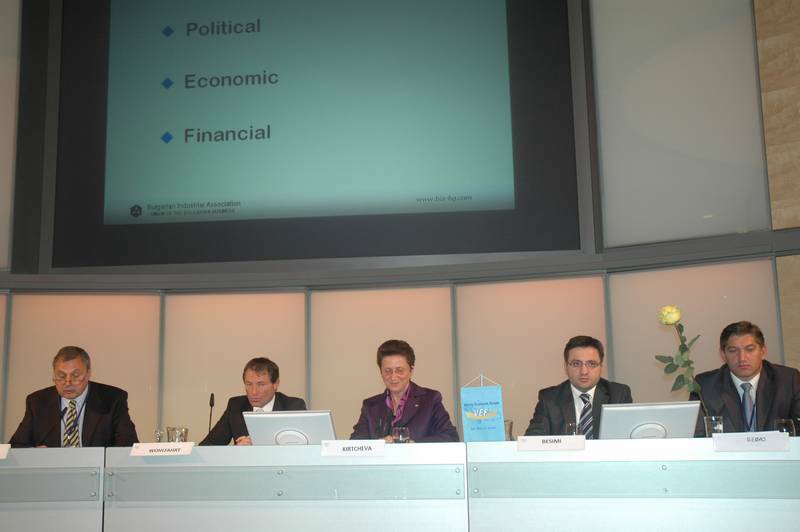 Vienna Economic Forum organised in cooperation with Oesterreichische Nationalbank on 27 February 2009 Vienna Economic Talks – The Financial Market Crisis: Effects and Implications for South-Eastern Europe. 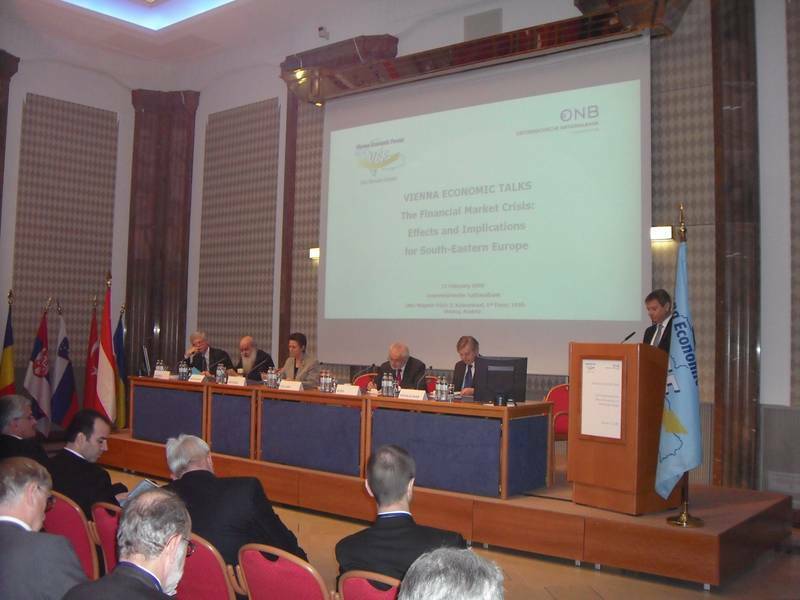 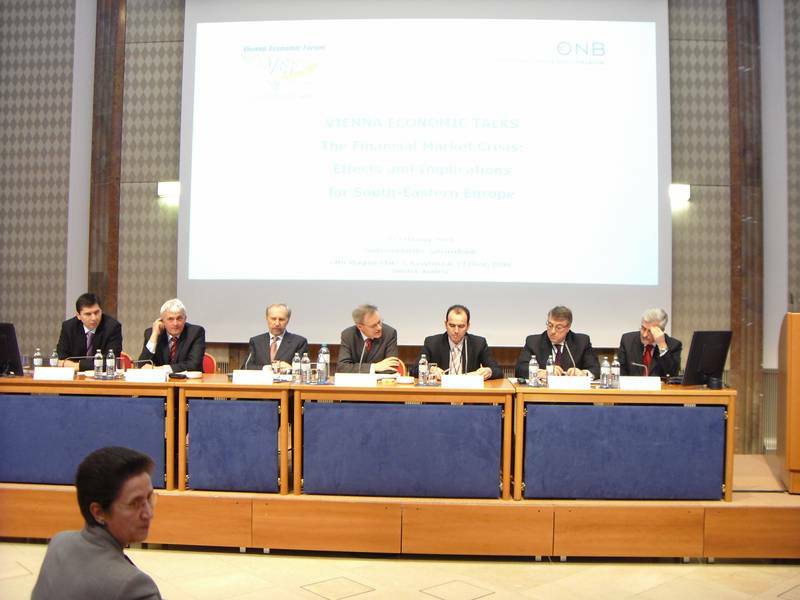 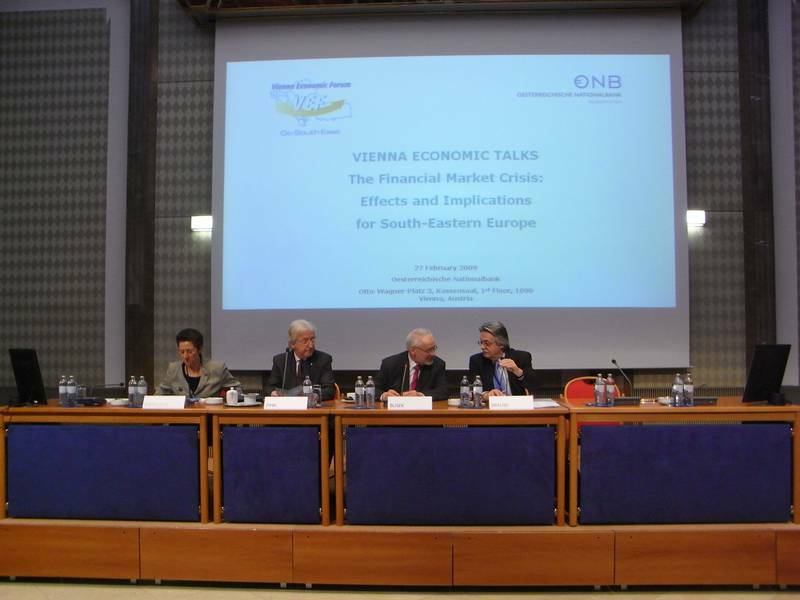 The meeting was opened by Dr. Peter Zöllner, Director of Oesterreichische Nationalbank, who in his Welcome Statement said he is glad to see Oesterreichische Nationalbank as the host of such an important meeting of the region of South-Eastern Europe and to welcome many Governors of the region of Vienna Economic Forum. 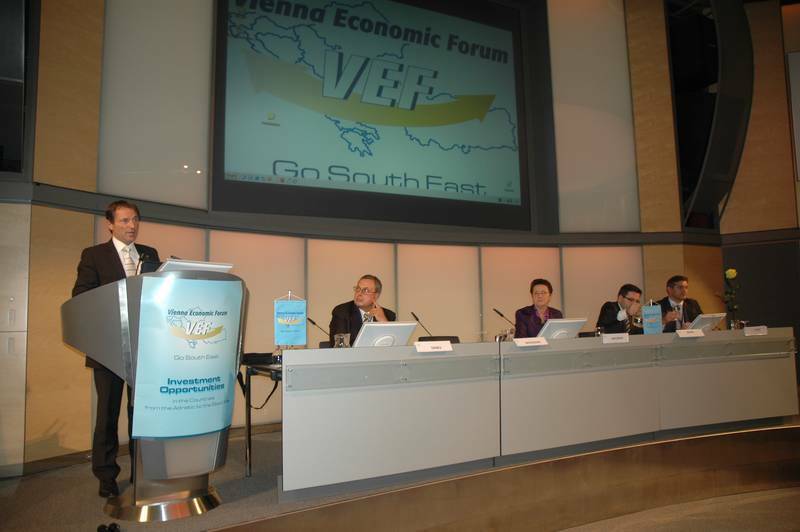 Secretary General Ambassador Dr. Elena Kirtcheva in her Statement was proud to introduce the newly created Vienna Economic Forum Governors Committee. 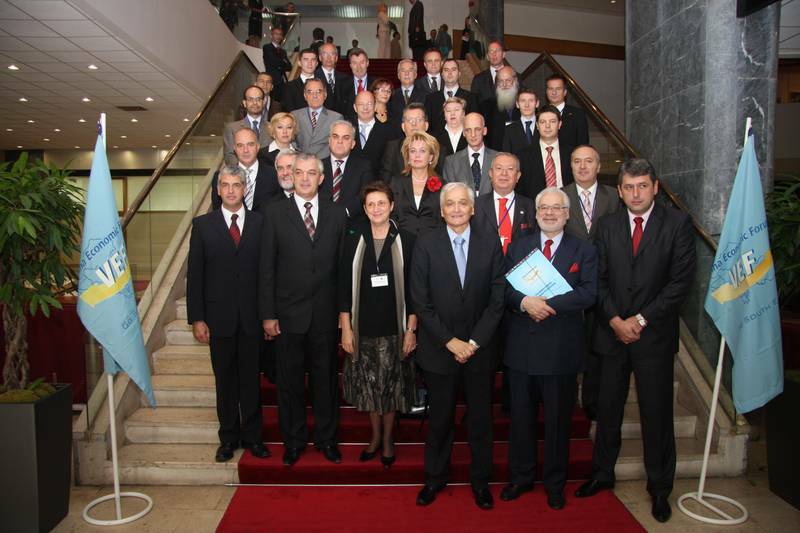 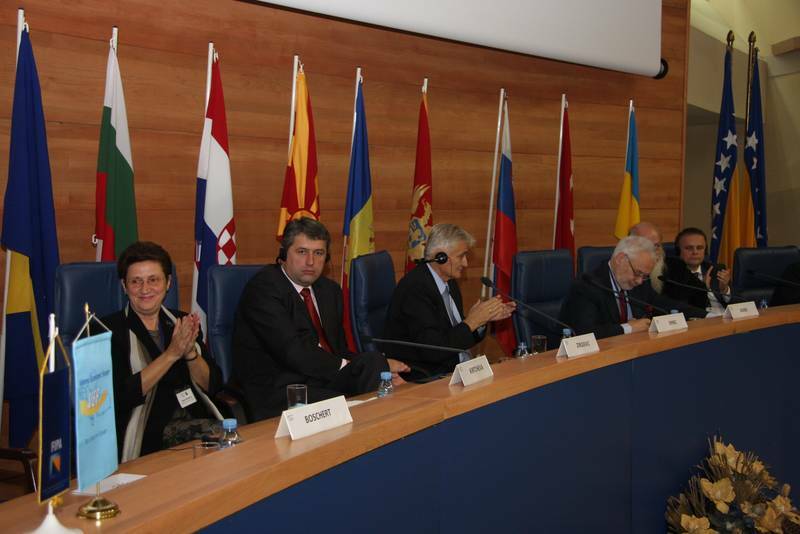 The Governors Committee was established with the official support from the Governors of the Member Countries of Vienna Economic Forum (Austria, Albania, Bosnia and Herzegovina, Bulgaria, Croatia, Macedonia, Moldova, Montenegro, Serbia and Slovenia) with the aim to encourage the meeting and cooperation of the institutions and persons, whose positions, capacities and knowledge are in demand today. 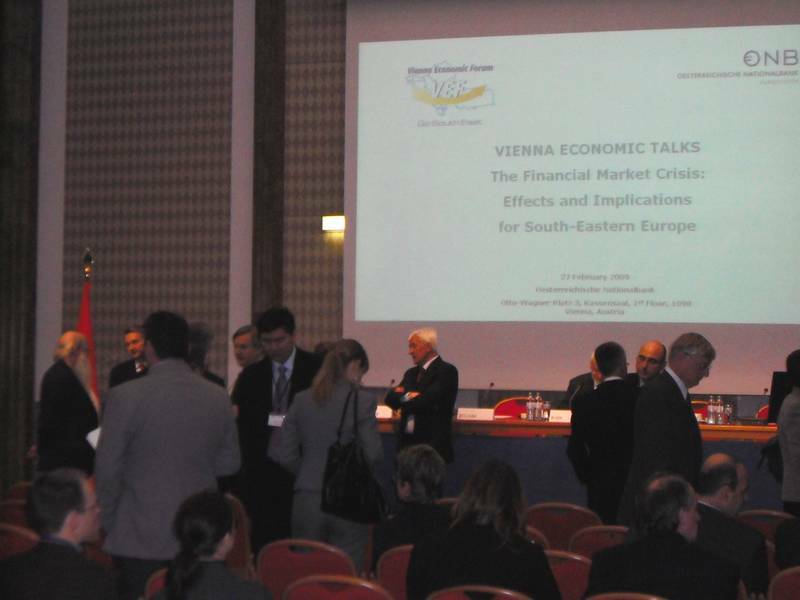 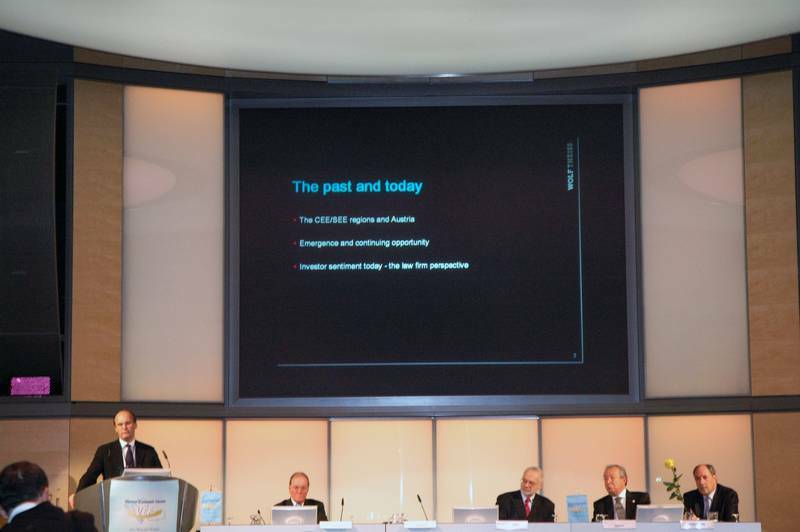 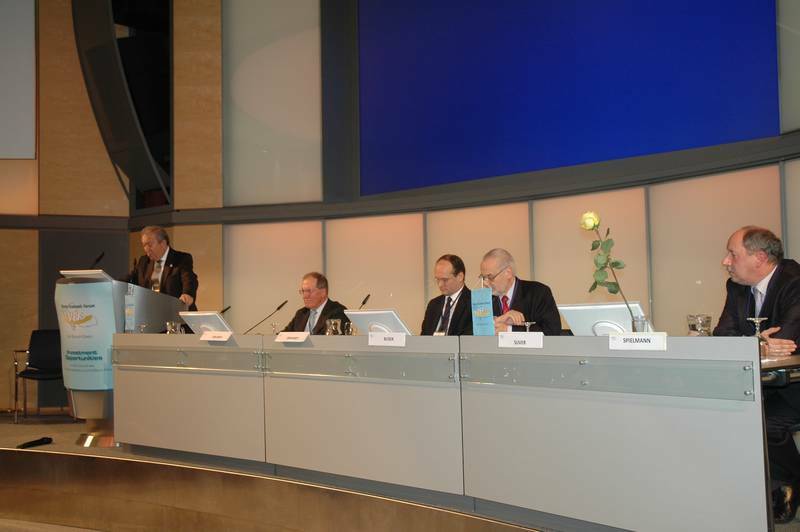 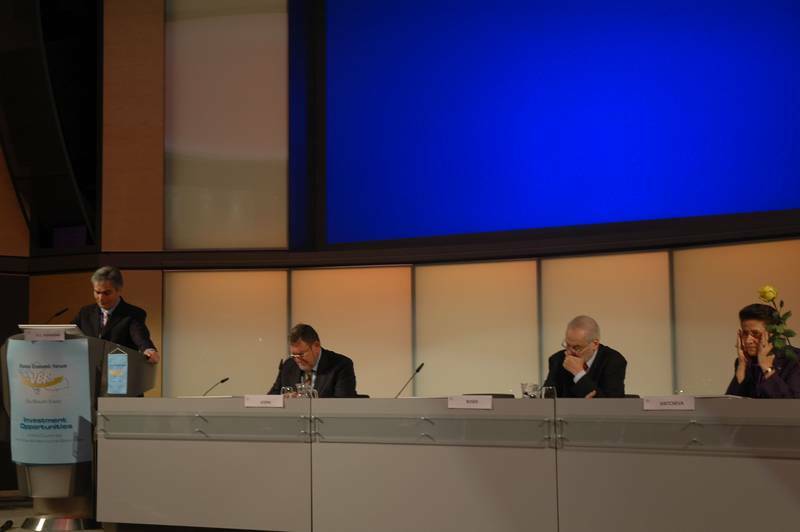 In the afternoon the Panel Discussion: “The Financial Market Crisis: Current Challenges and Future Perspectives” was moderated by Dr. Erhard Busek, President of Vienna Economic Forum. 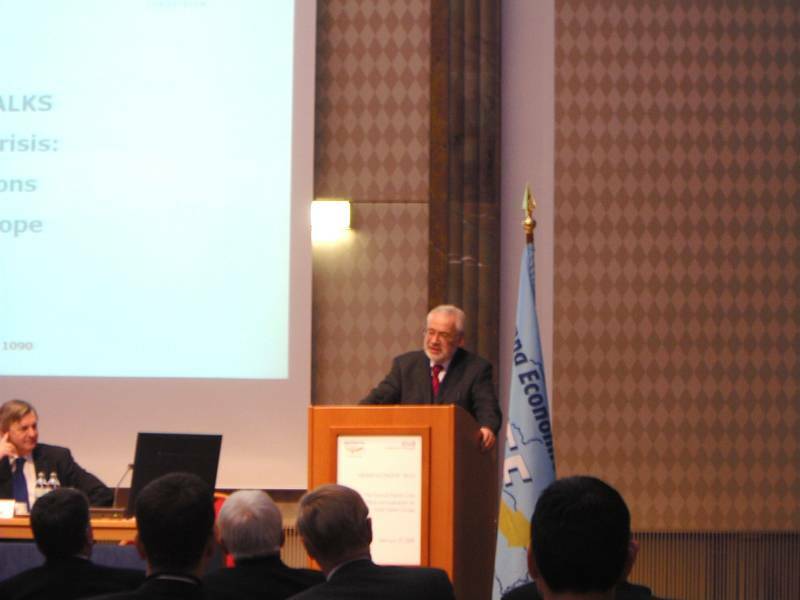 Dr. Busek underlined the importance of such a meeting to increase the exchange of experience amongst experts and clearly define a strategy. 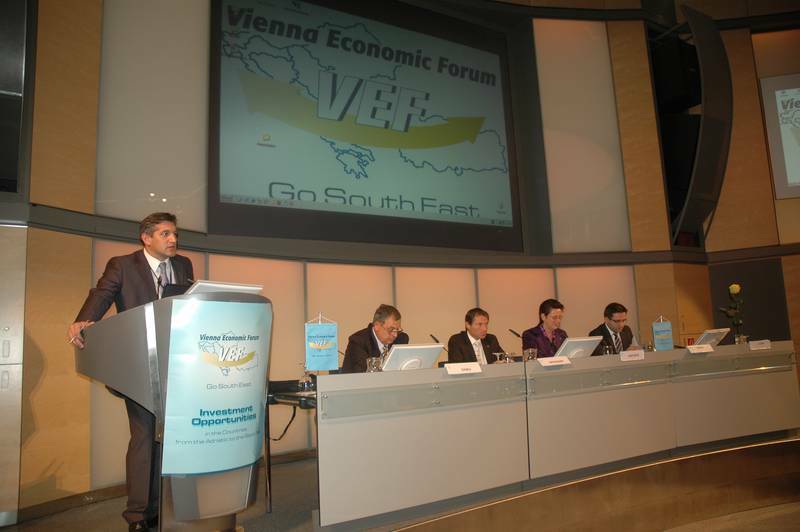 The concept of cooperation is the concept of Vienna Economic Forum which has been successfully experienced in the last five years since its founding. 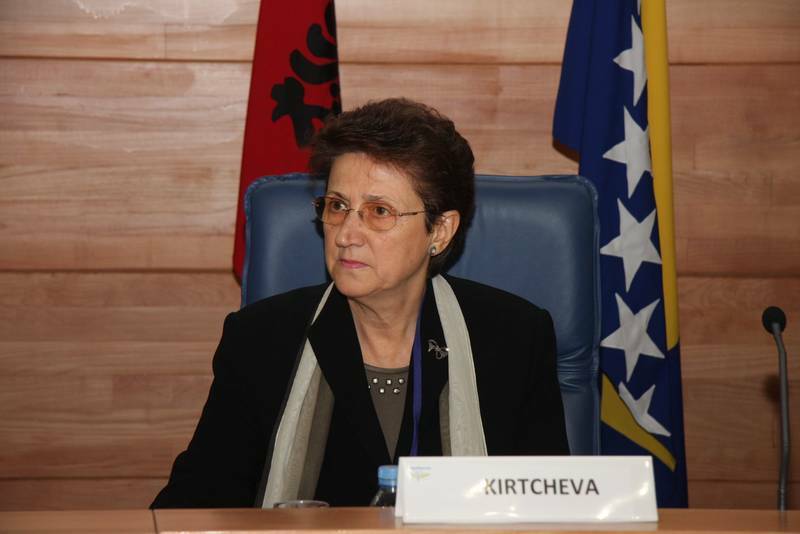 Following the wish of many participants of the meeting for further cooperation, Ambassador Dr. Kirtcheva stated she is convinced that cooperation is the key word, and the need for cooperation, especially in times like these, is even more evident. 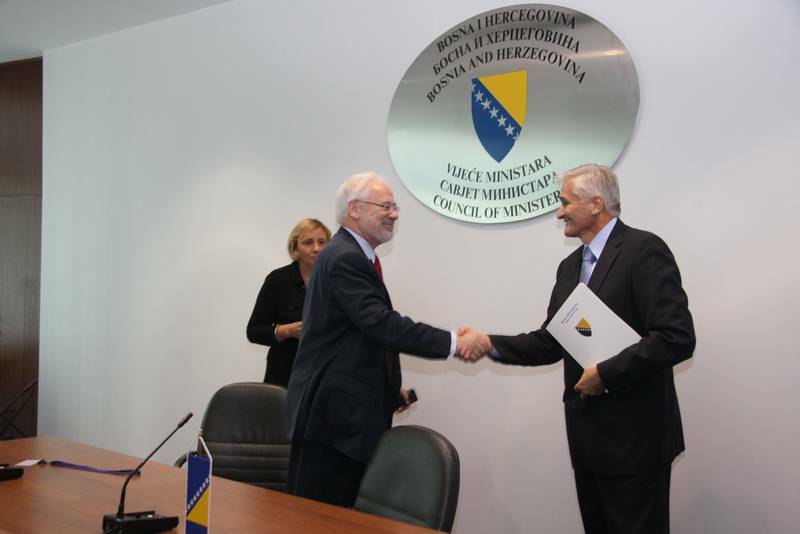 And this meeting should be only the beginning of a series of meetings on current topics which require close cooperation and further development. 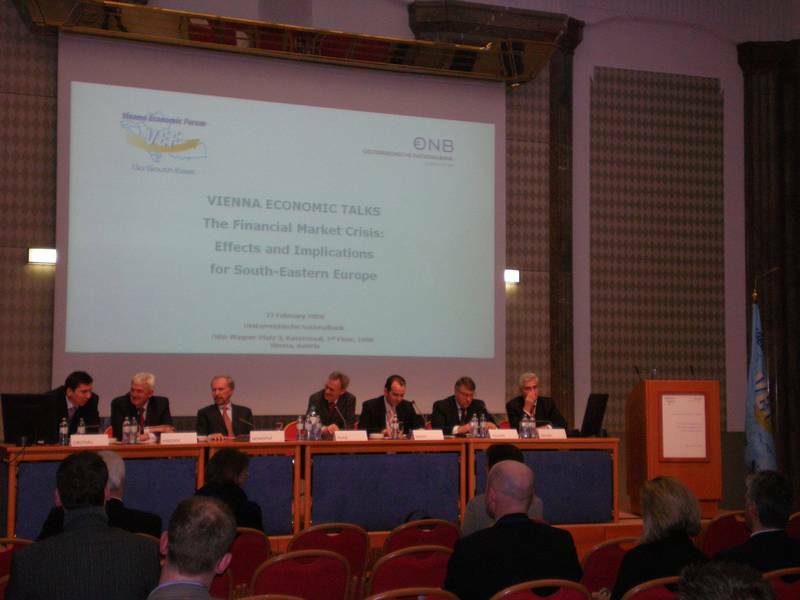 Vienna Economic Forum remains committed organising such meetings.